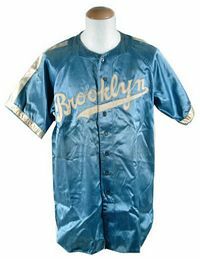 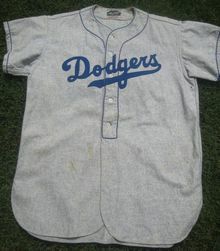 The Dodgers tore the heart out of Brooklyn when they left for Los Angeles after the 1957 season. 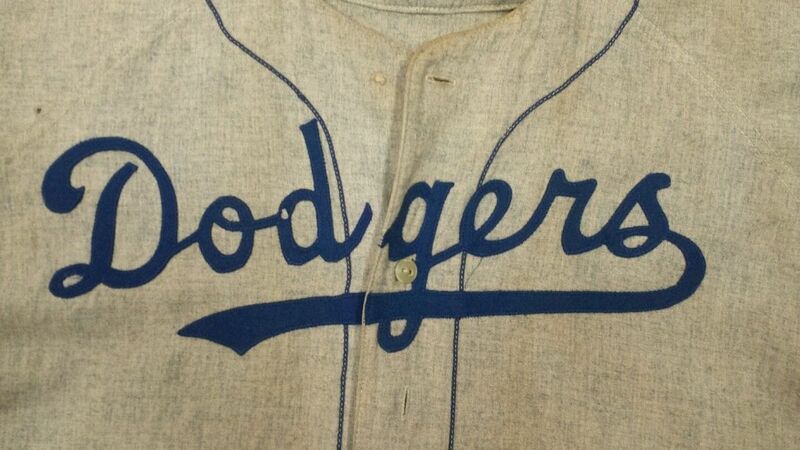 Dodgers did not become an official name until 1932. 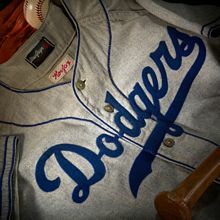 Fans and media also called the team Trolley Dodgers, Grooms, Bridesgrooms, Superbas and Robins interchangeably. Red Old English "B" on home jersey, navy "BROOKLYN" across road jersey. 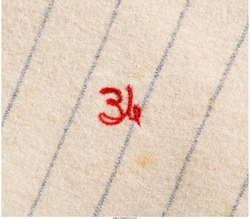 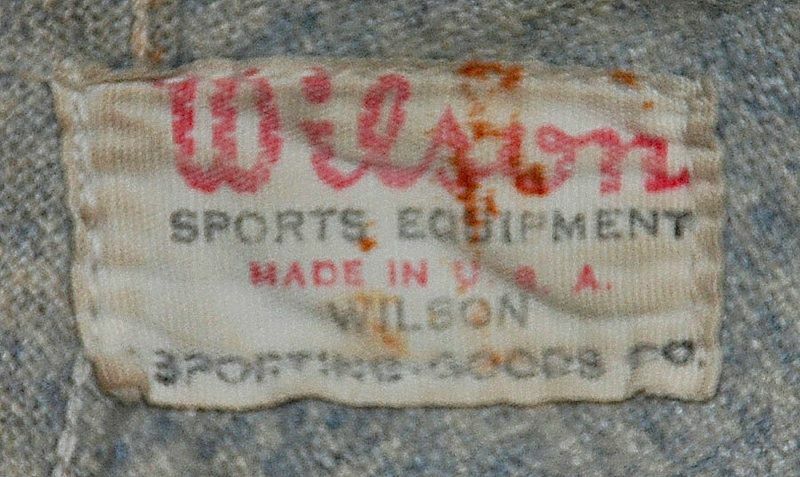 Road jersey script changed to red. 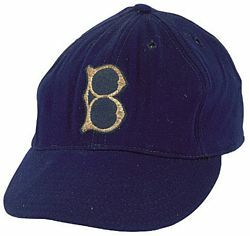 Home "B" is also navy now. Home "B" is large again, road jersey is checkered. 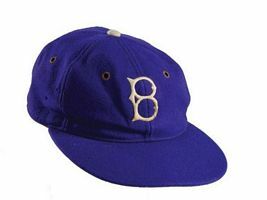 The familiar "B" logo appears on home jersey. 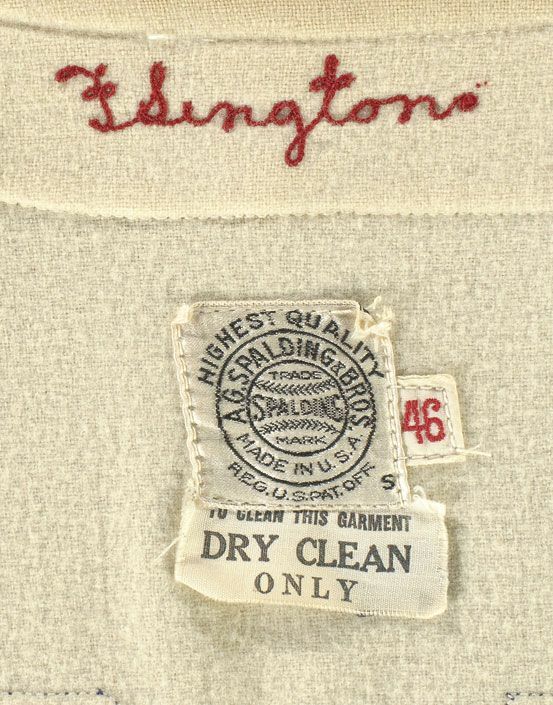 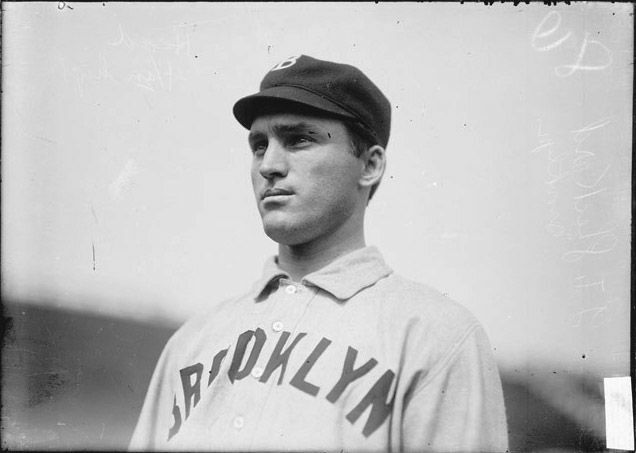 "B" in a diamond logo appears on left home sleeve, "BROOKLYN" down the placket on road shirt. Pinstripes added to road shirt. 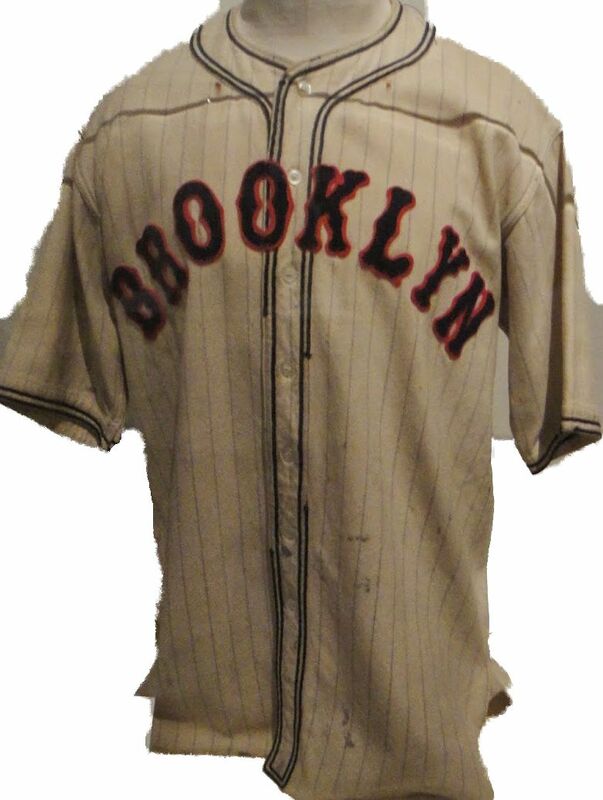 Home and road pinstripes have the B in a diamond logo on the left sleeve. 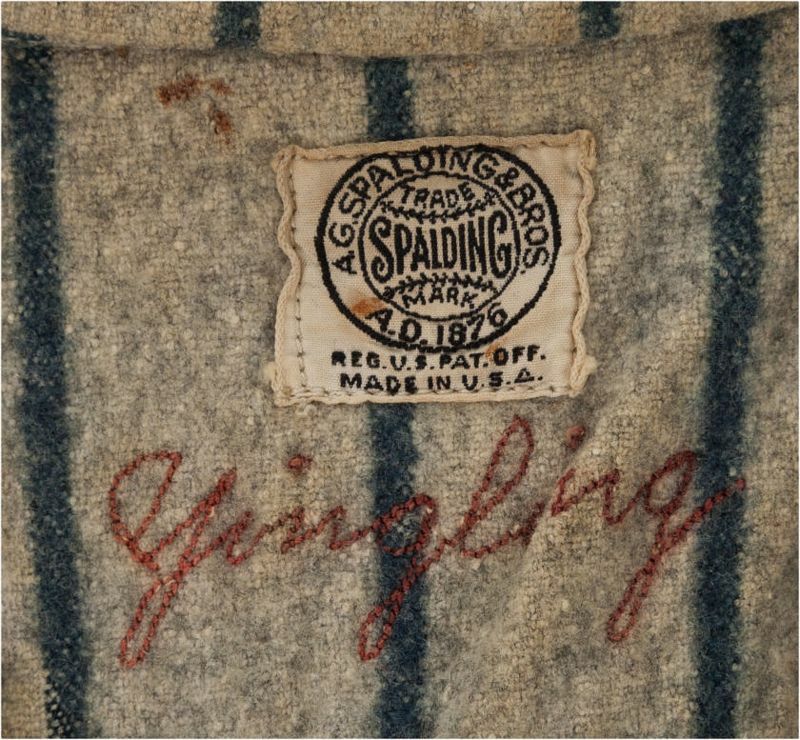 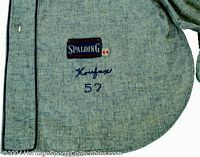 Blue added to home placket, "BROOKLYN" down the road placket. 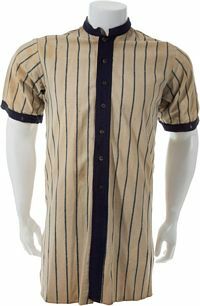 Checkered look at home and road. One road style has a large "B", a second road jersey has a smaller "B". 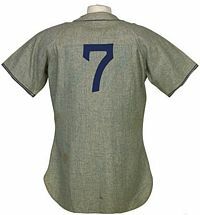 Home jersey sports a U.S. flag. 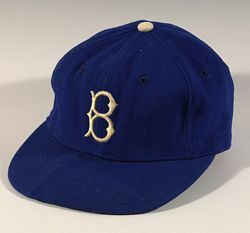 "B" logo returns to home jersey. Road jersey loses the pinstripes. Home jersey is blank pinstripes, road jersey pinstripes with logo on left sleeve. 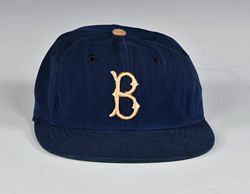 "B" logo returns to both jersey chests. 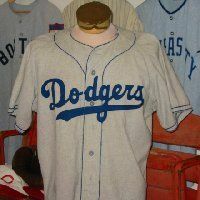 Logo dropped from home jersey. 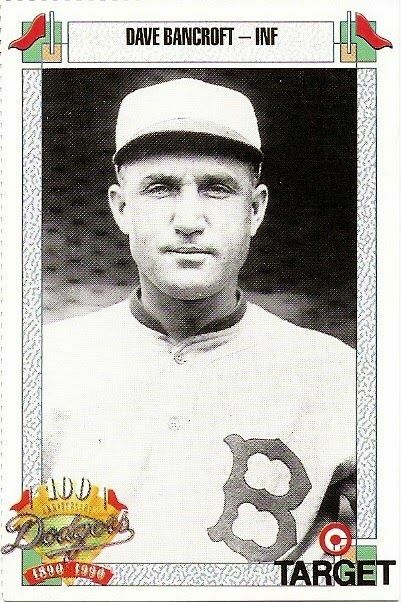 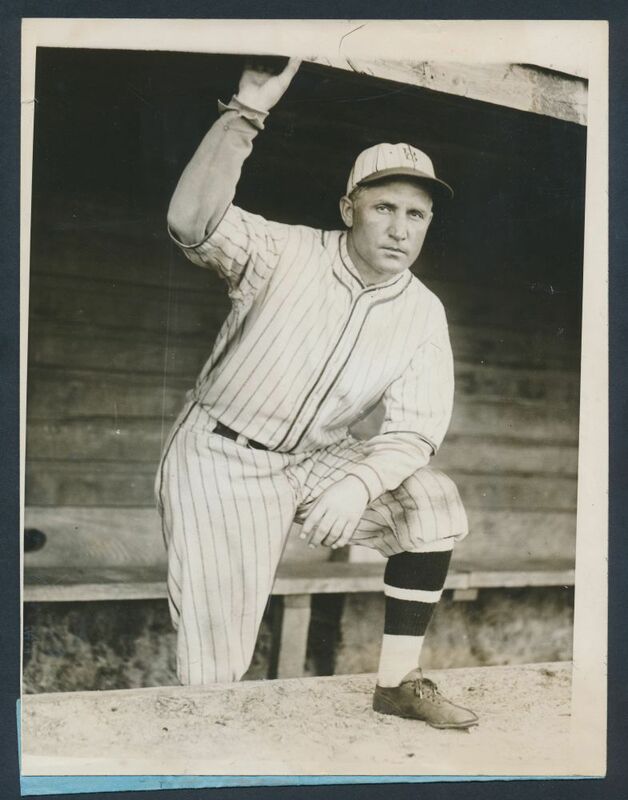 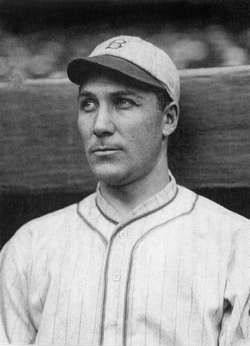 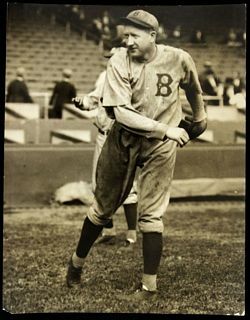 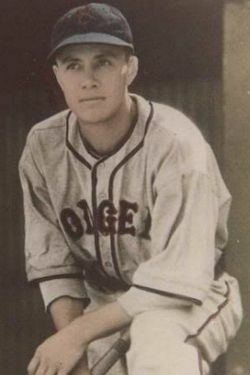 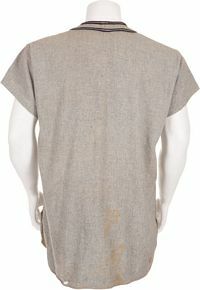 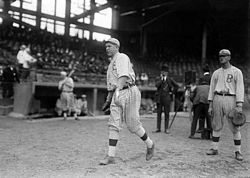 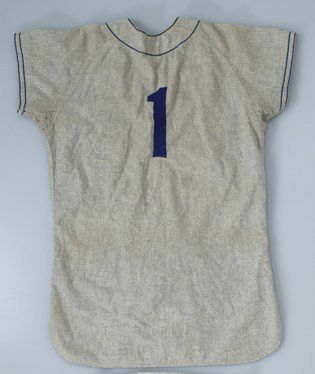 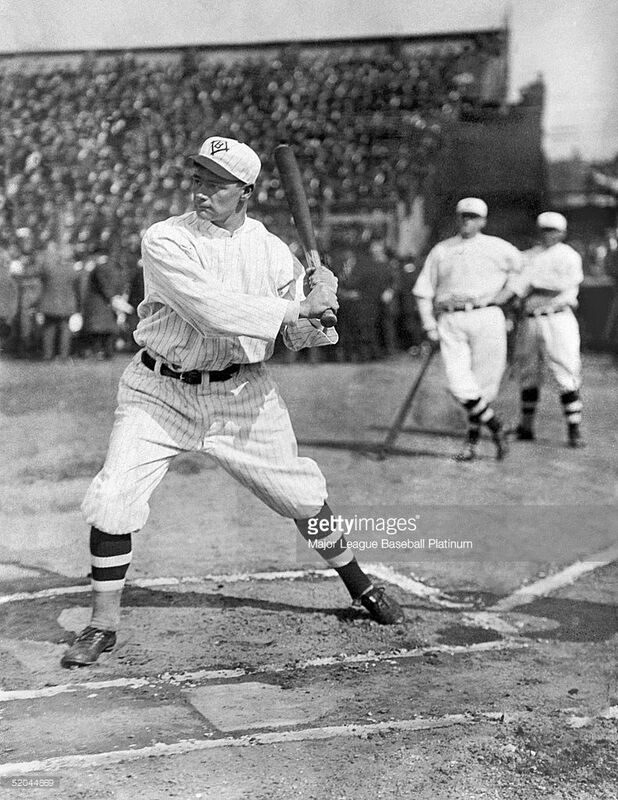 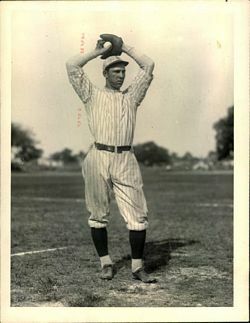 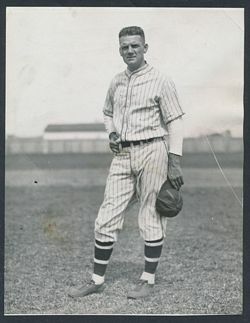 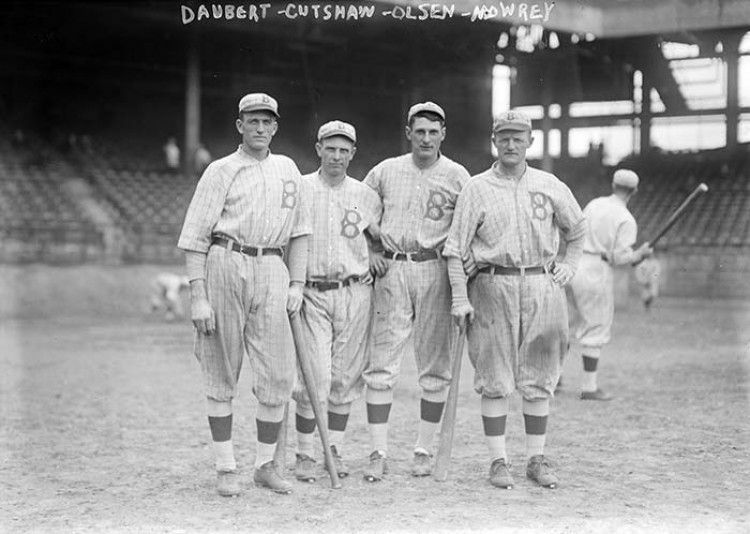 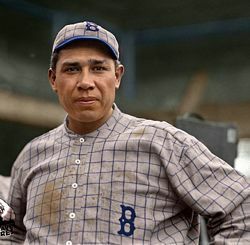 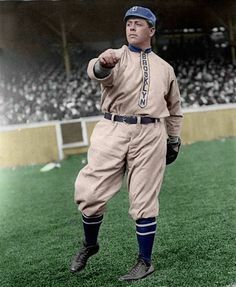 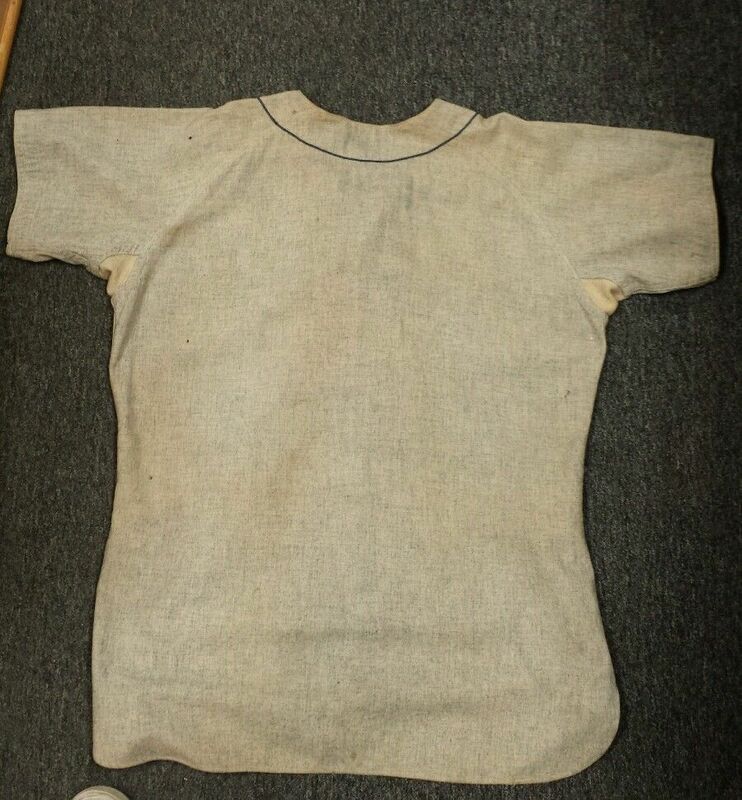 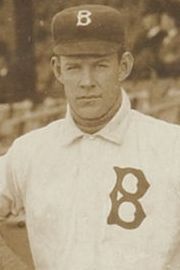 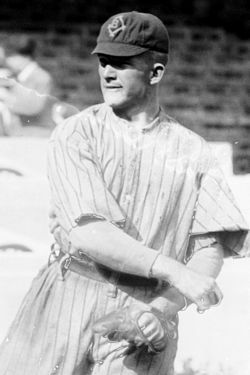 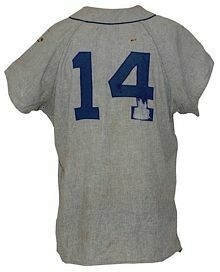 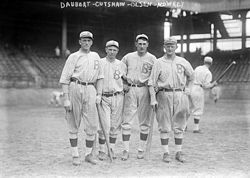 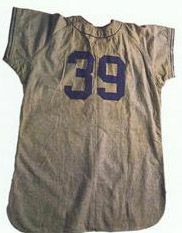 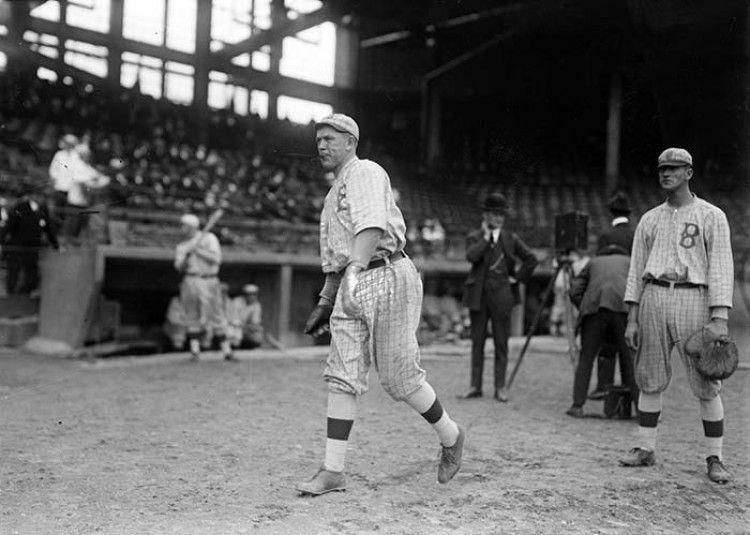 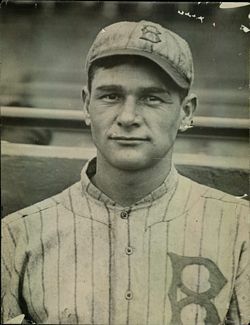 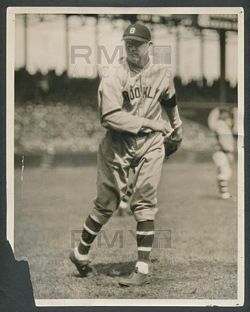 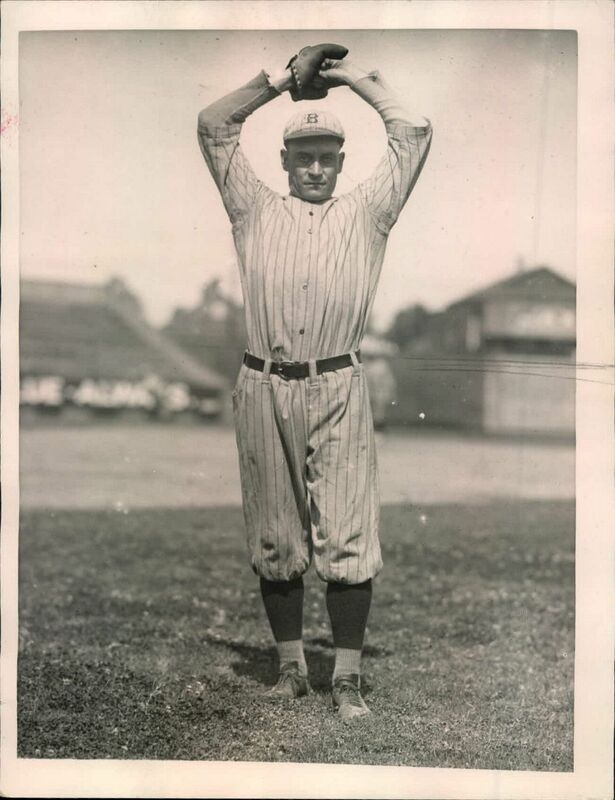 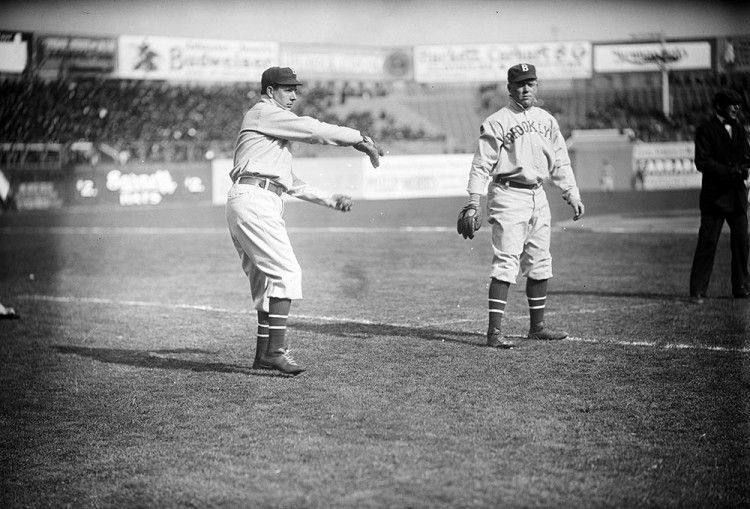 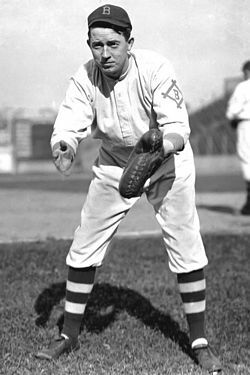 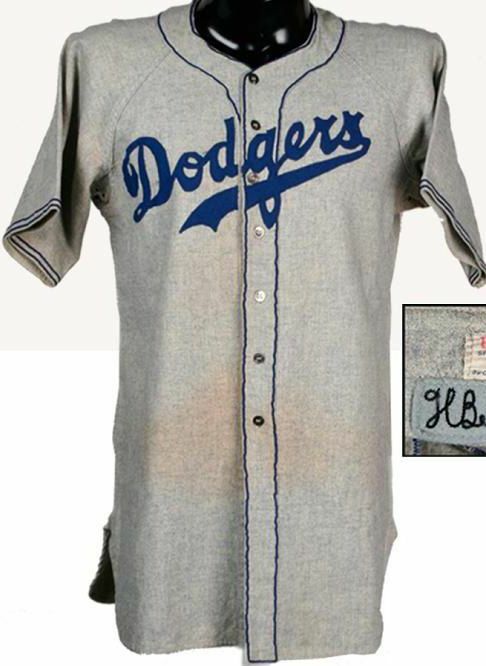 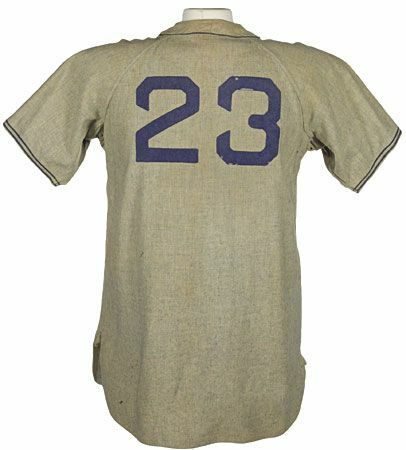 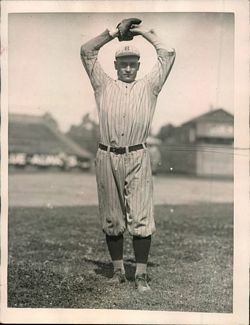 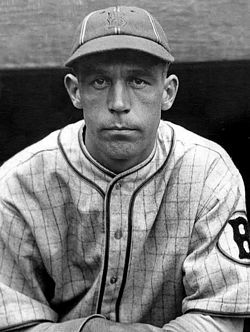 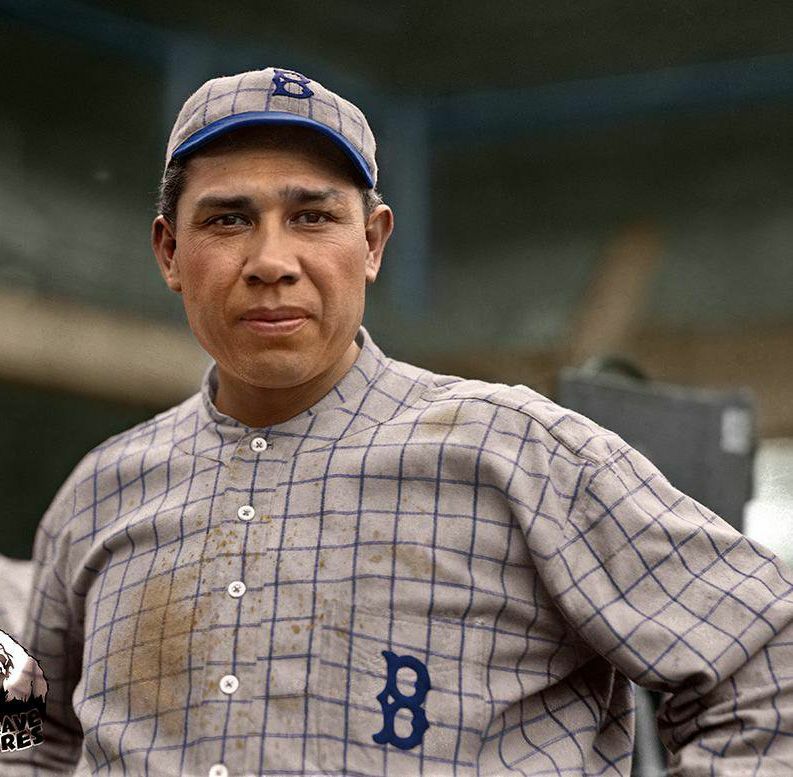 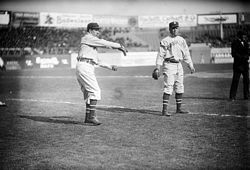 A second plain road grey jersey is worn in 1924, it does not appear in the HOF database. 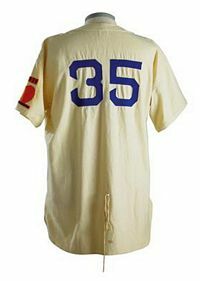 NL Golden Jubilee logo on left chest of home shirt, left sleeve on road. 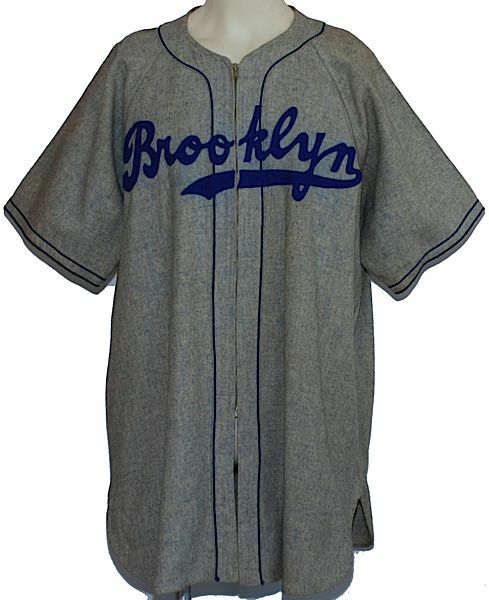 "BROOKLYN" lettering on plain grey road jersey. 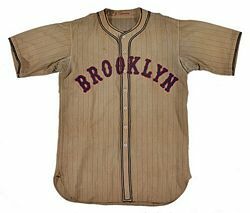 Home is blank pinstripes, road is pinstripes with B in diamond logo on the sleeve. 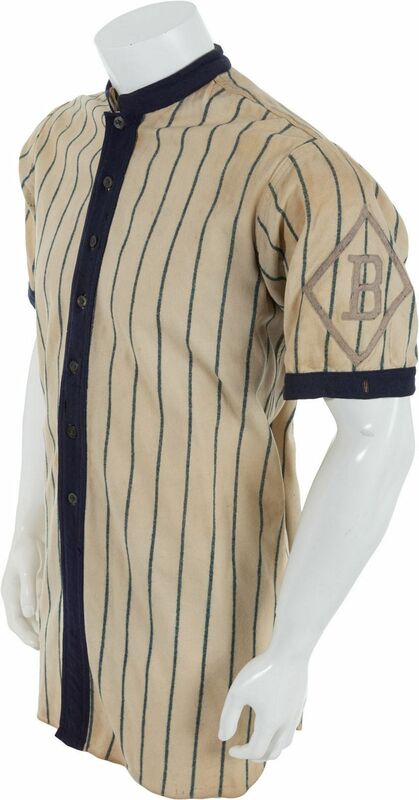 Road jersey now checkered with "B" in a red circle on the sleeve. Road jersey now grey with "B" on the chest. 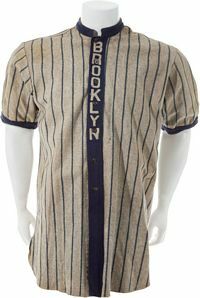 "BROOKLYN" returns to road jersey chest. 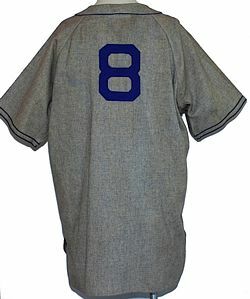 Plain white home jersey with block "B" on left sleeve, grey road with block "B" on chest. 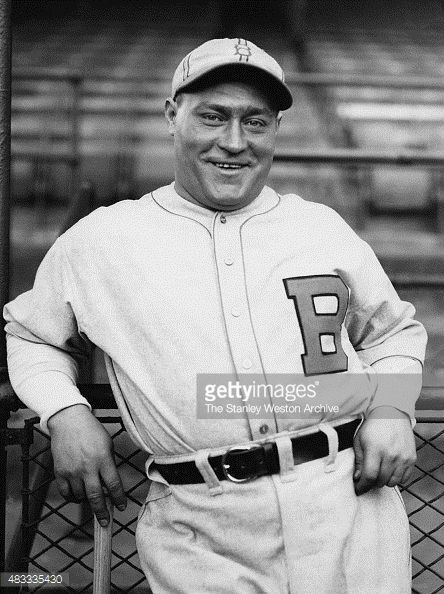 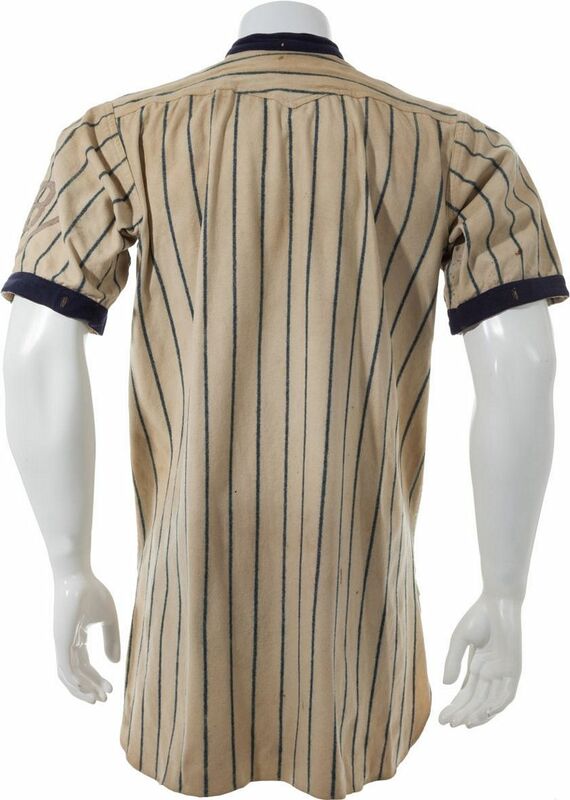 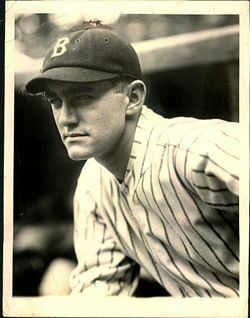 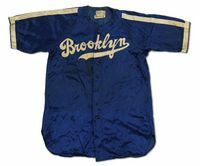 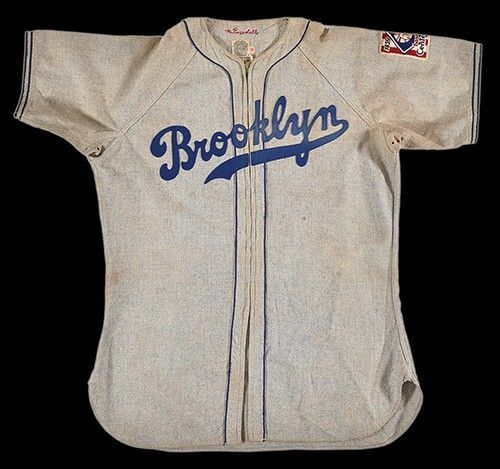 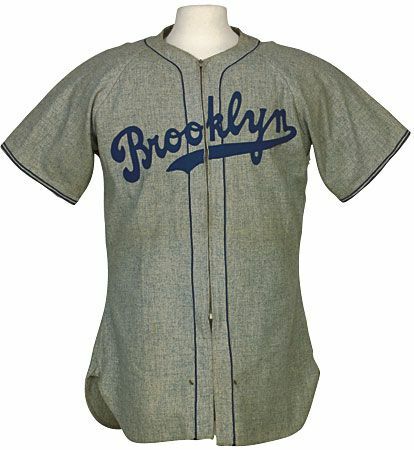 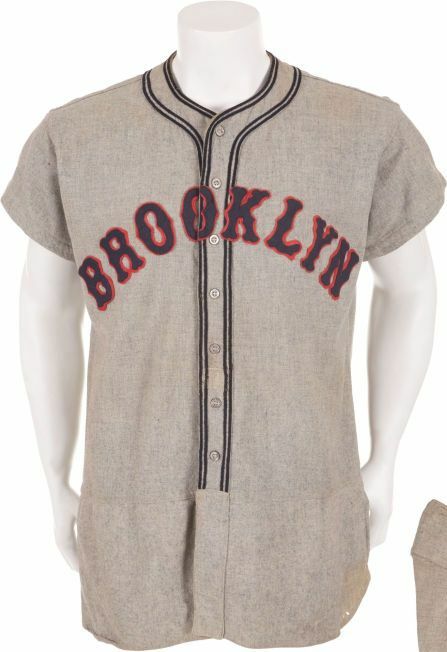 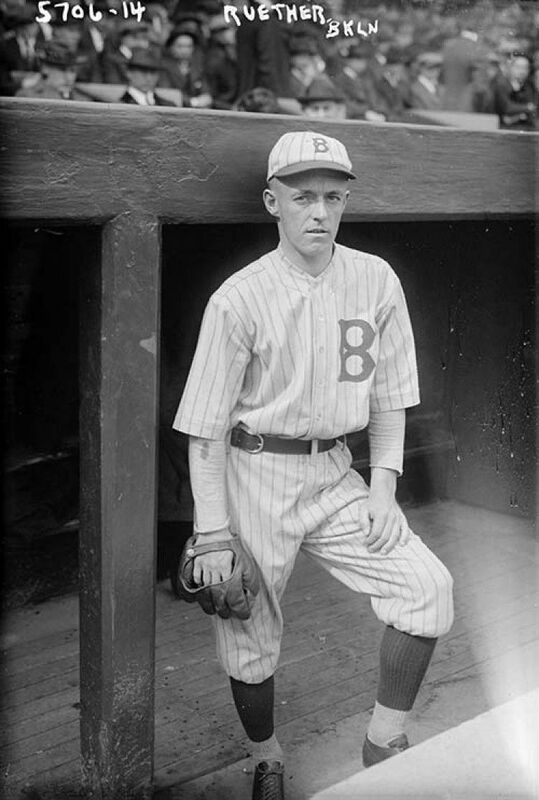 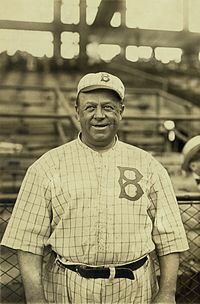 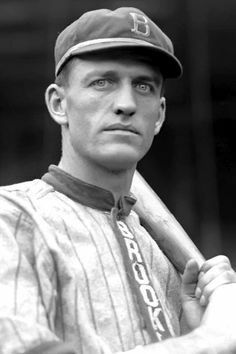 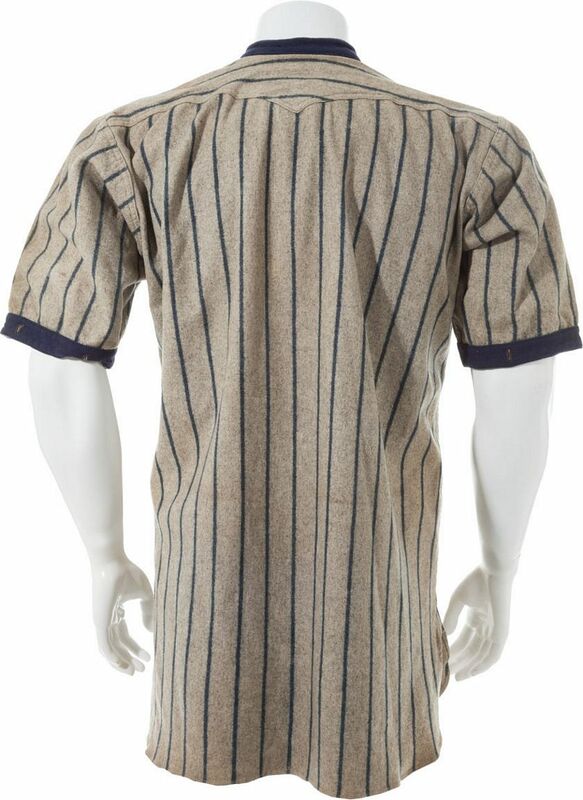 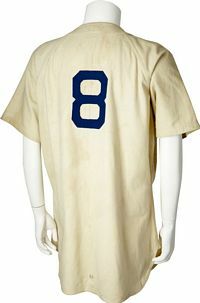 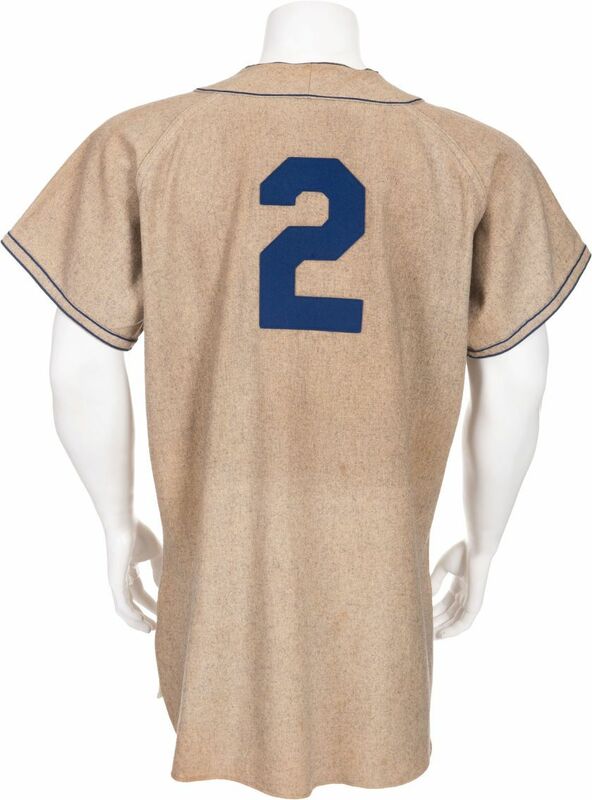 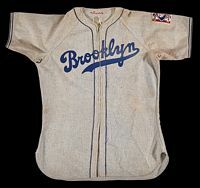 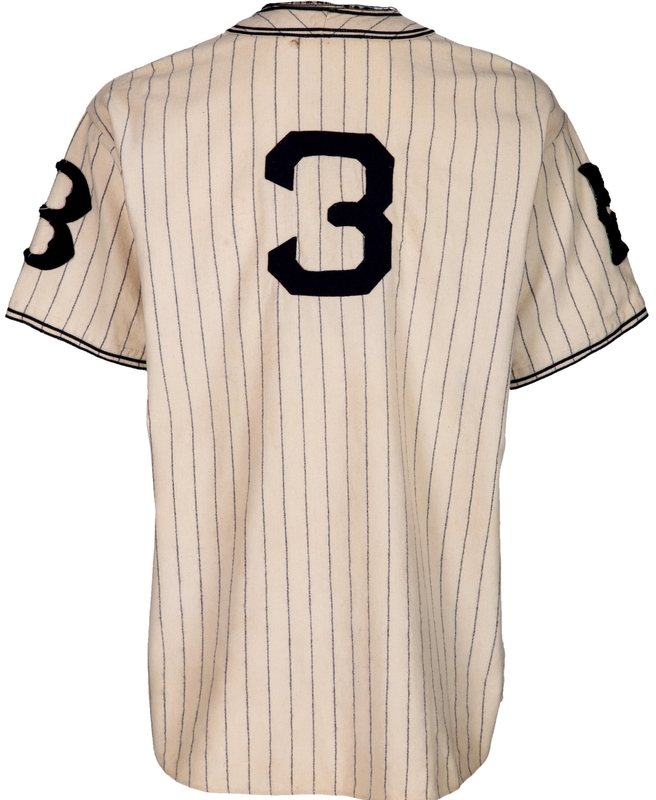 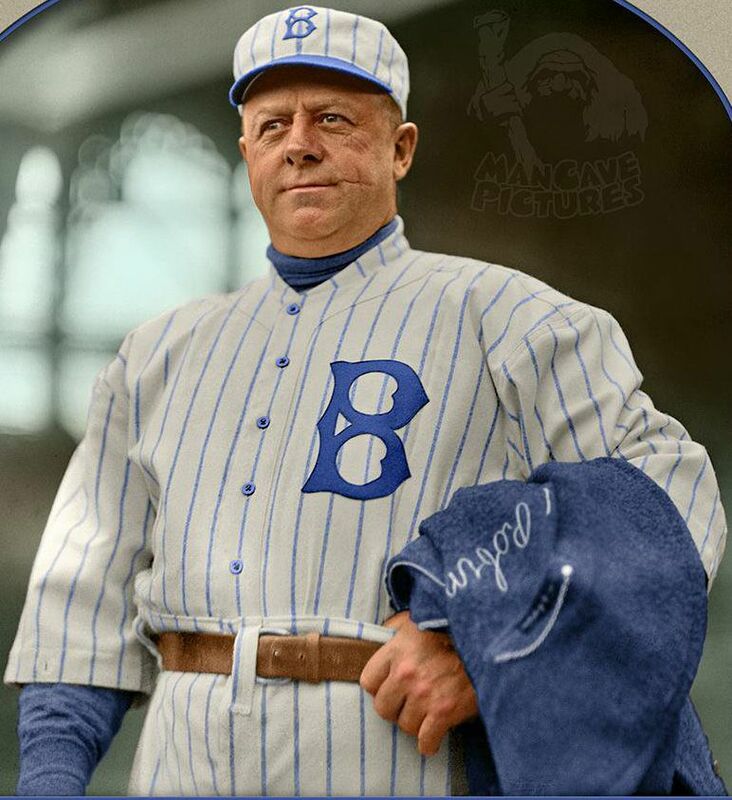 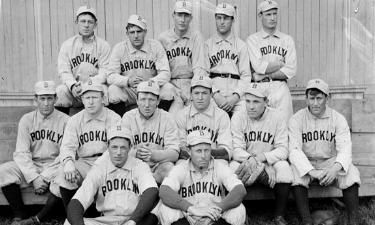 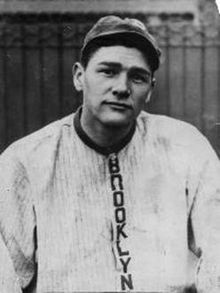 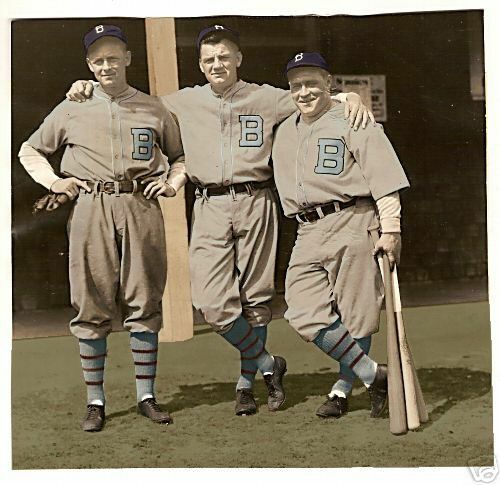 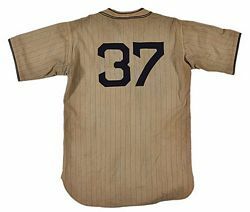 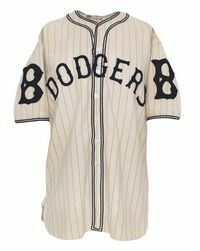 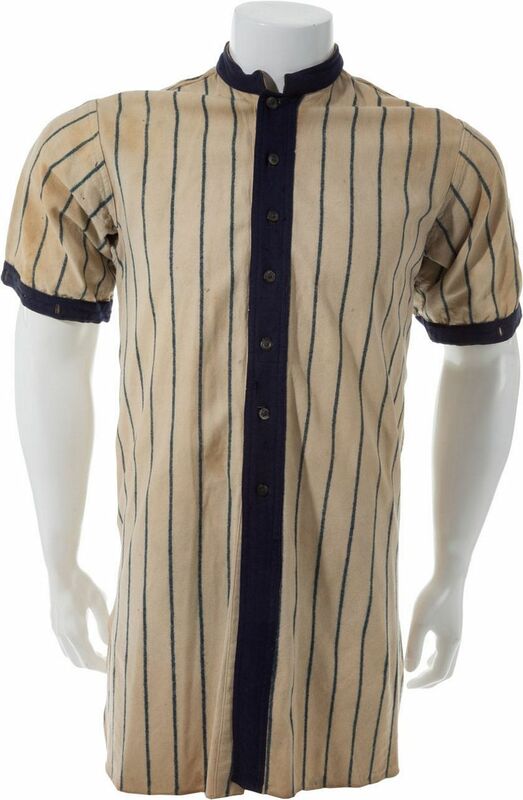 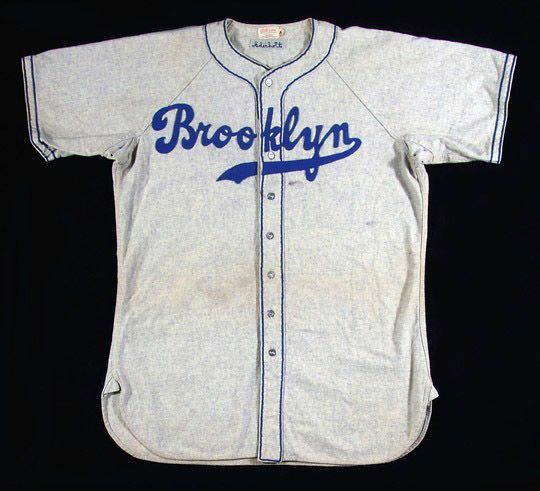 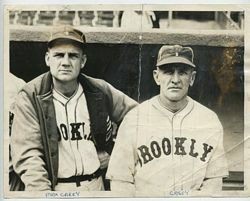 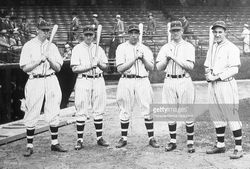 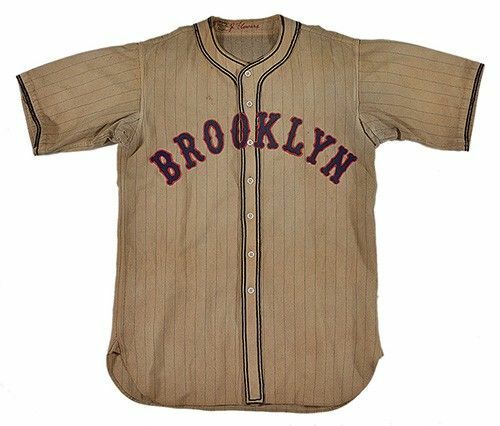 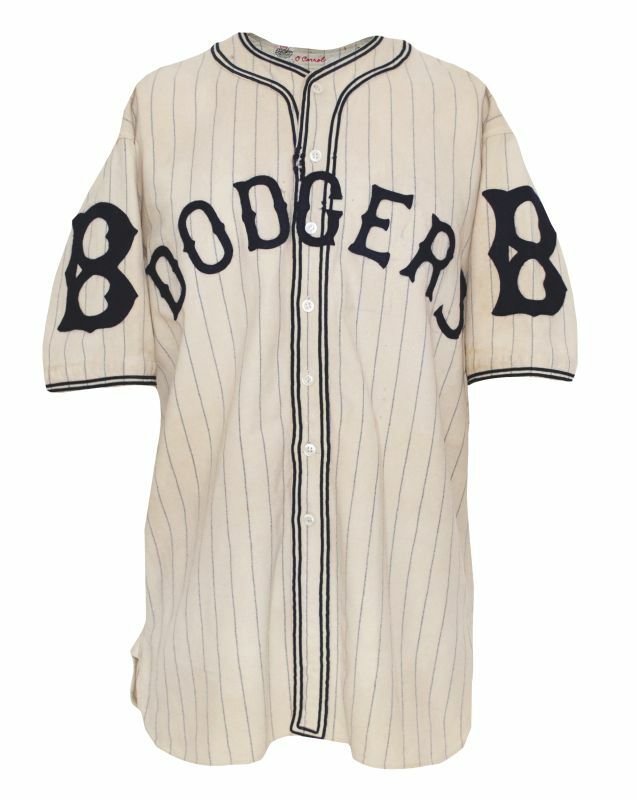 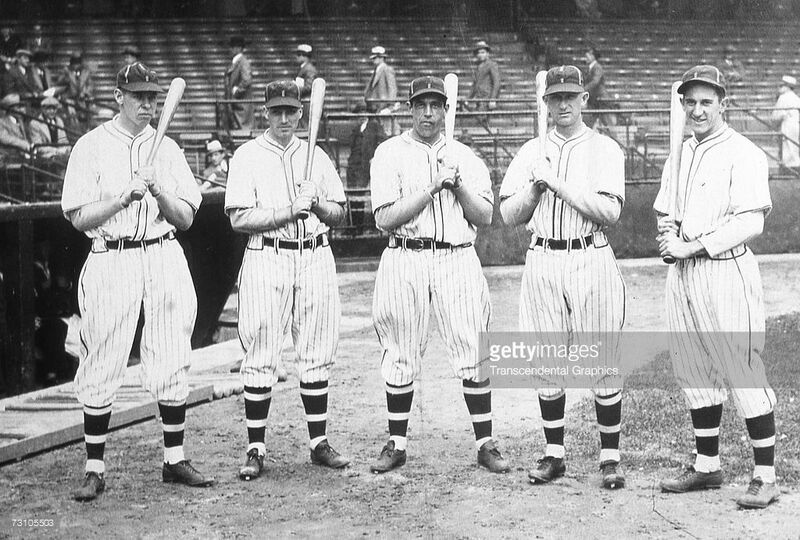 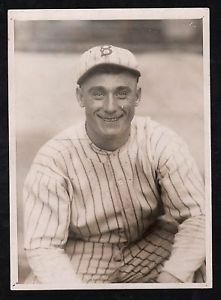 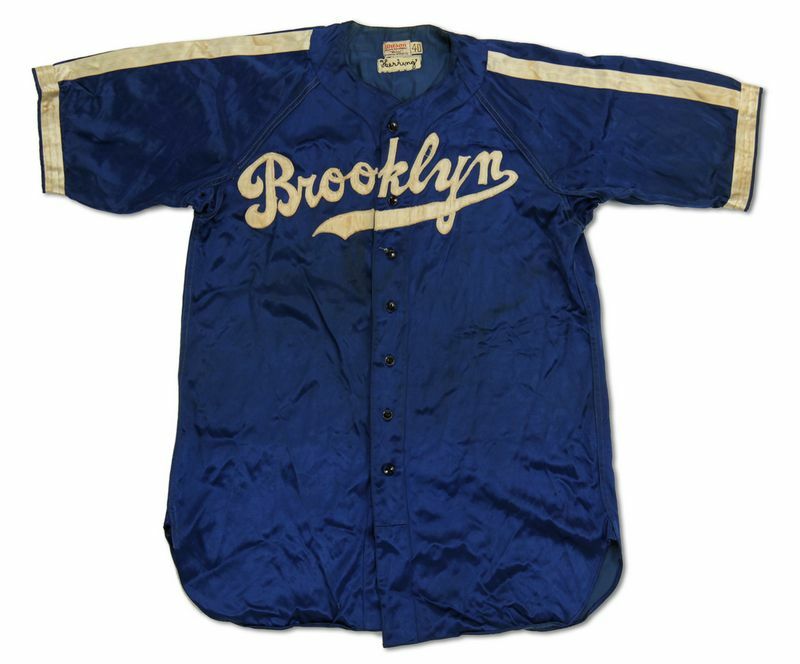 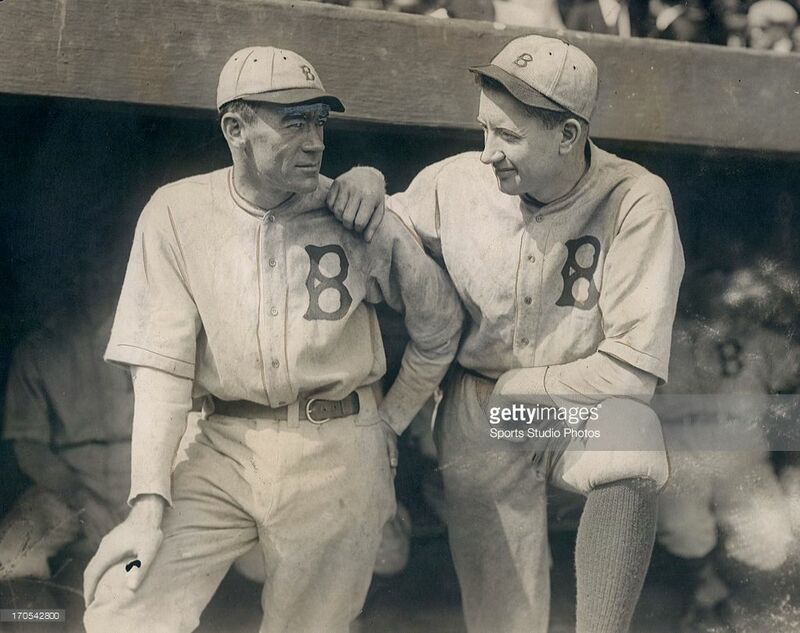 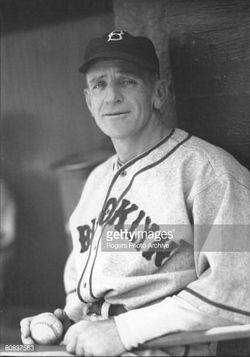 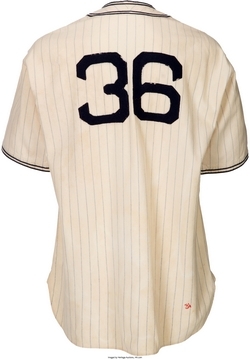 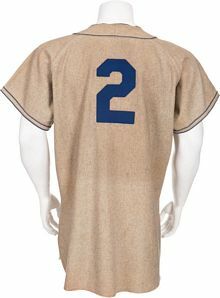 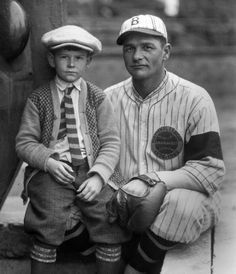 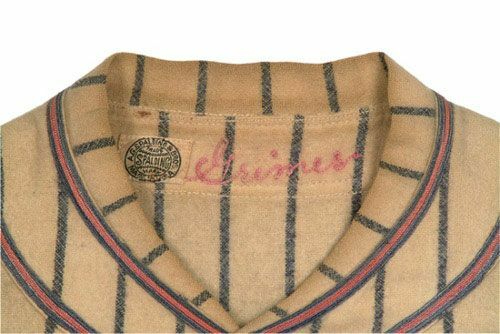 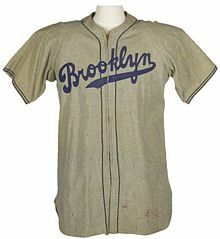 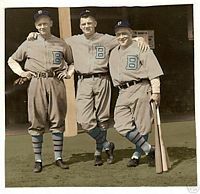 At the start of the 1932 season home jerseys were blank pinstripes with stylized "B" logo on the sleeve, road jersey has "Brooklyn" in tuscan. 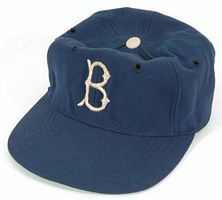 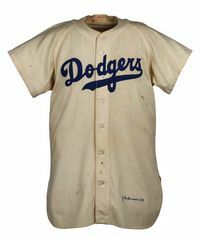 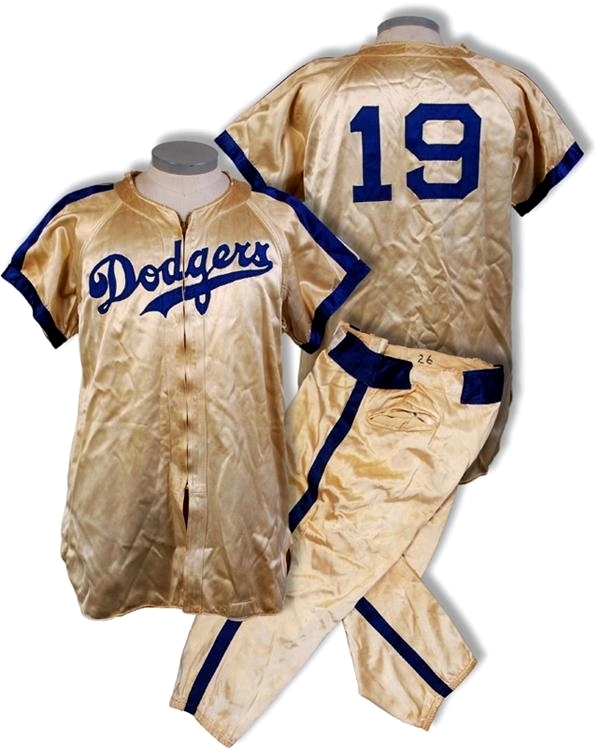 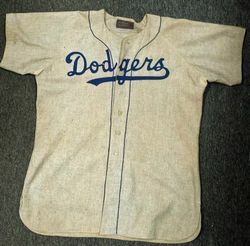 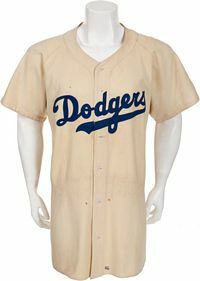 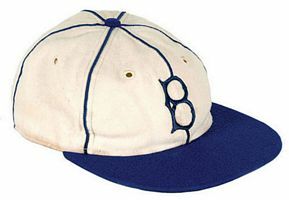 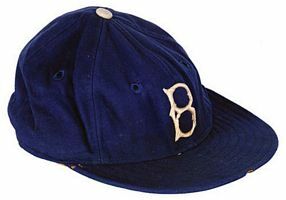 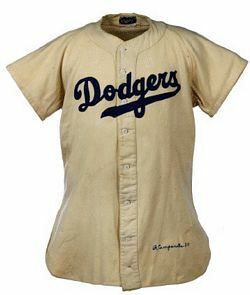 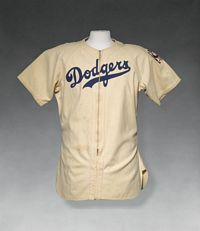 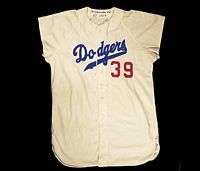 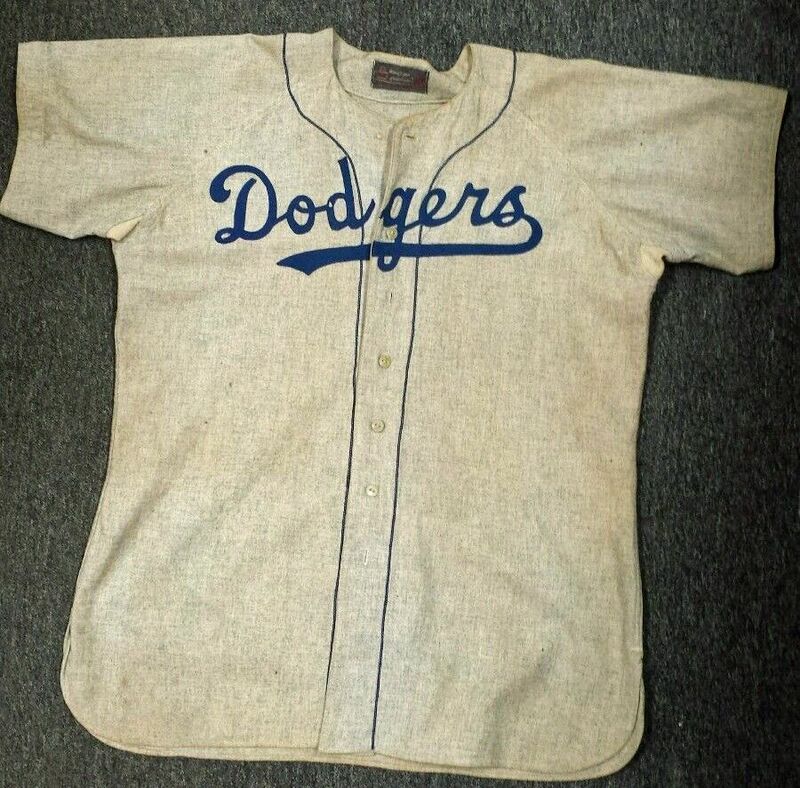 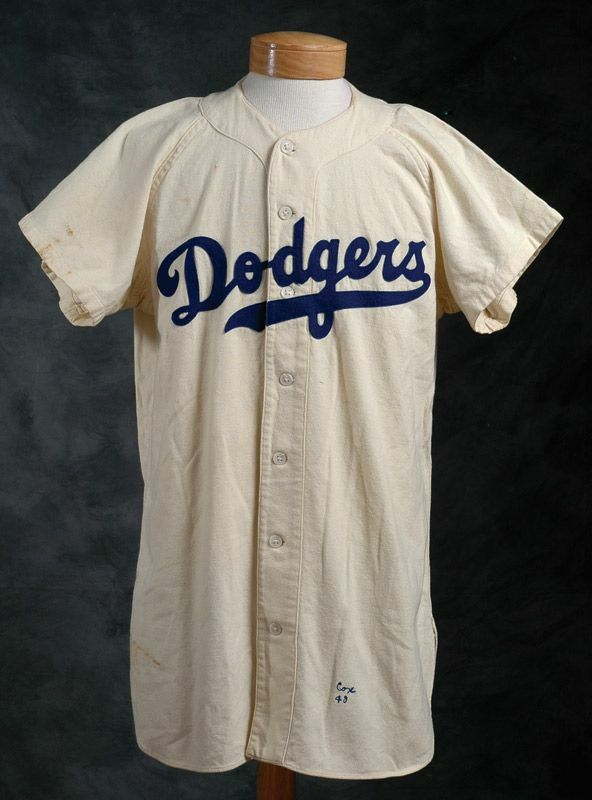 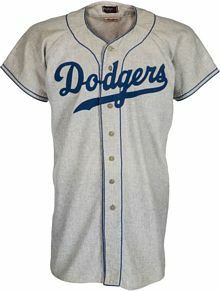 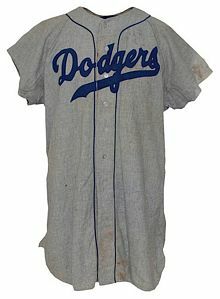 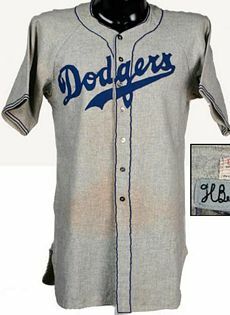 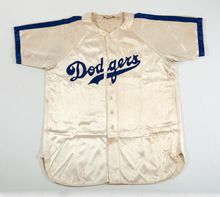 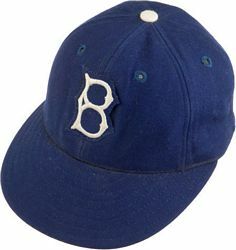 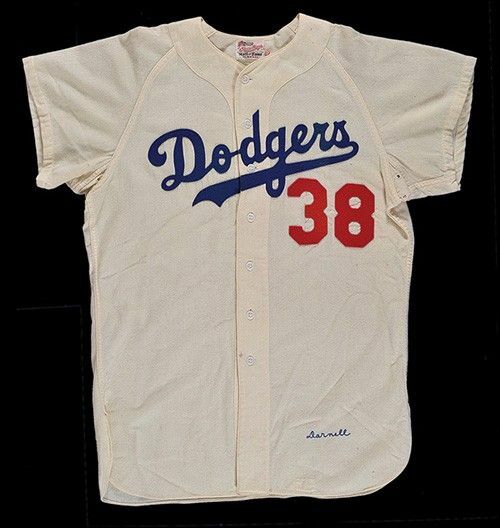 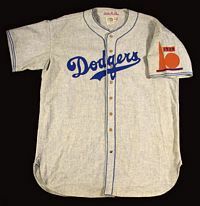 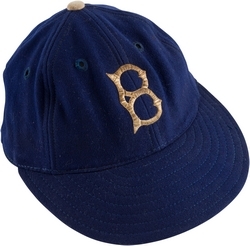 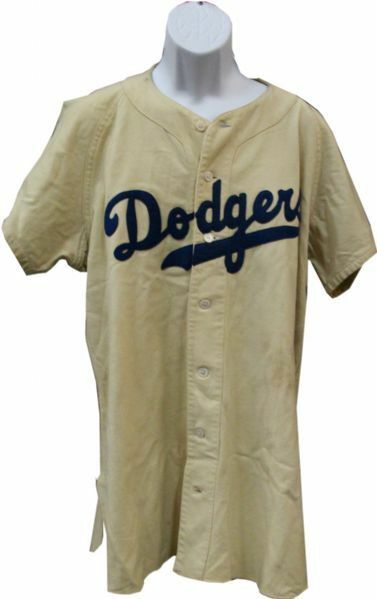 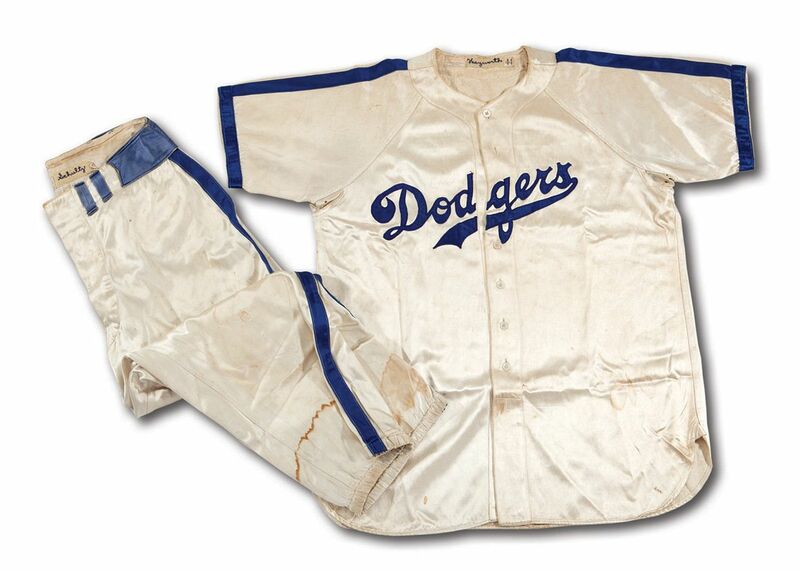 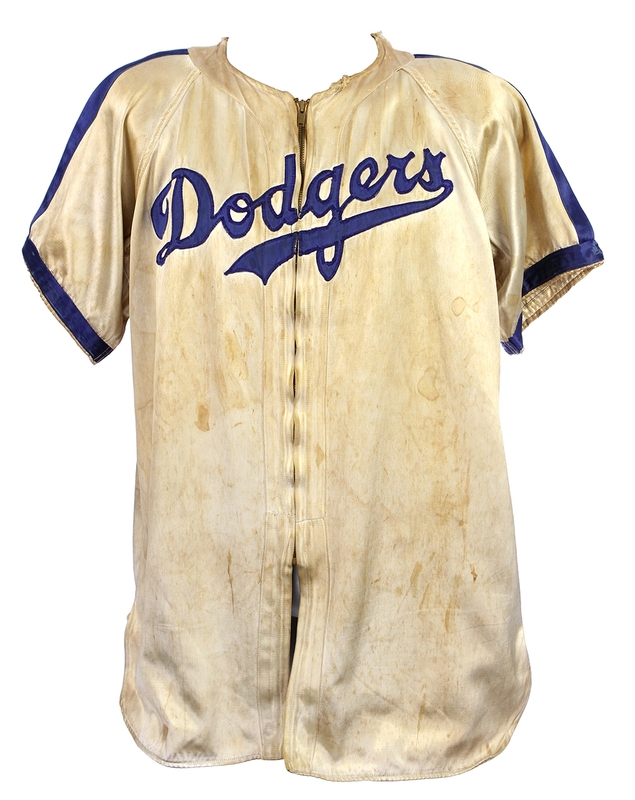 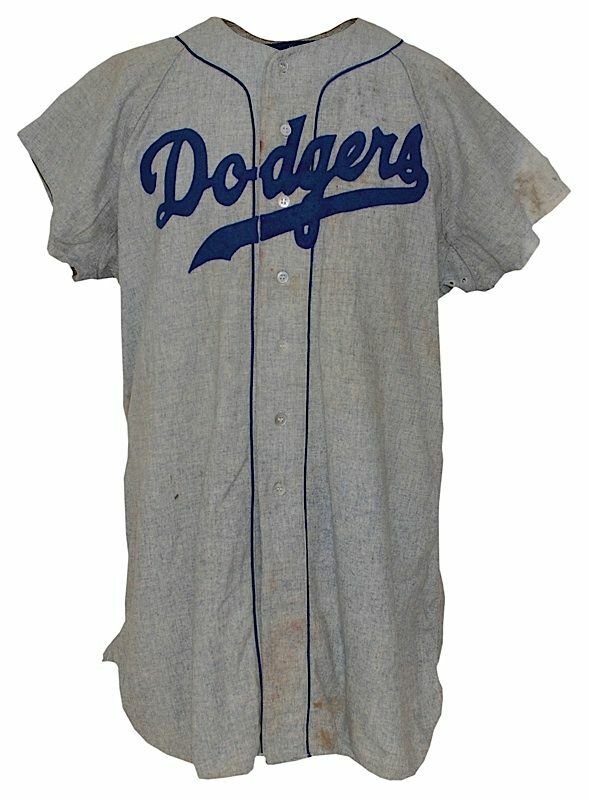 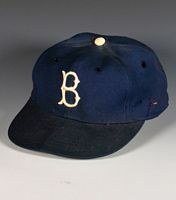 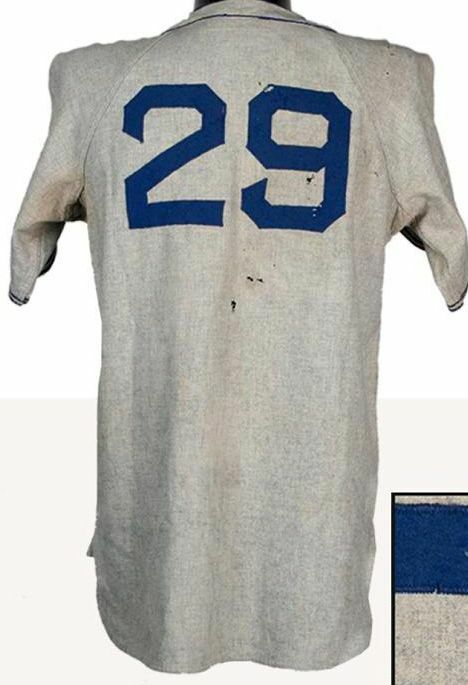 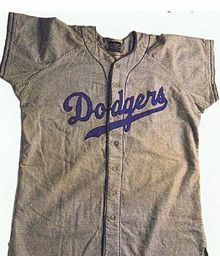 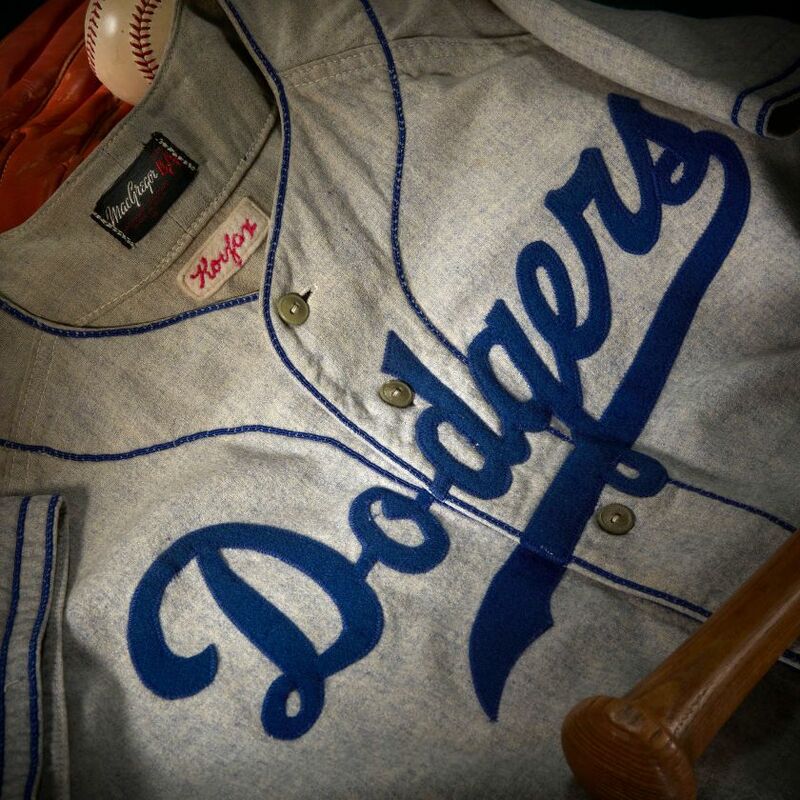 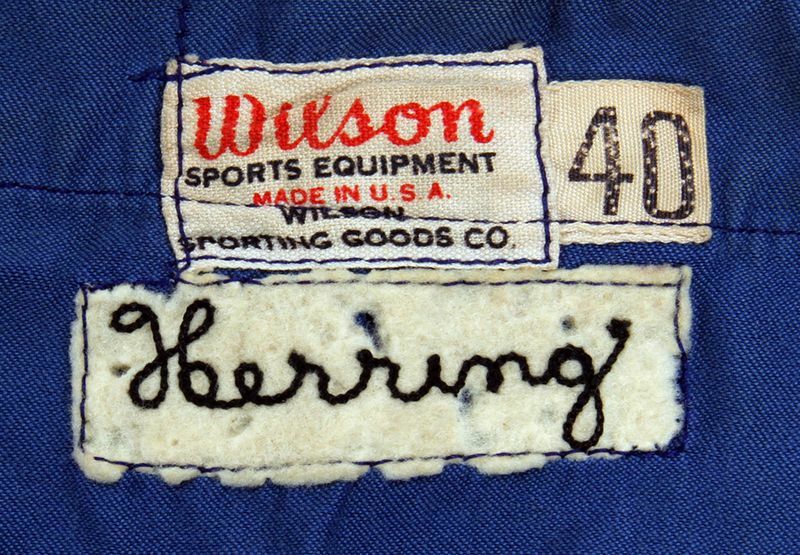 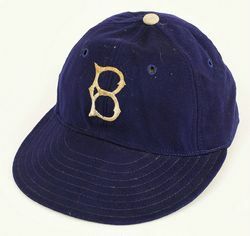 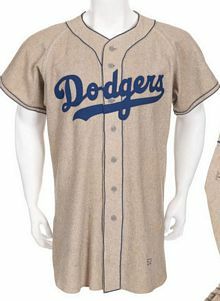 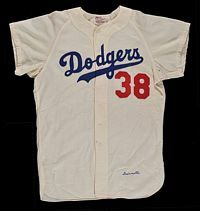 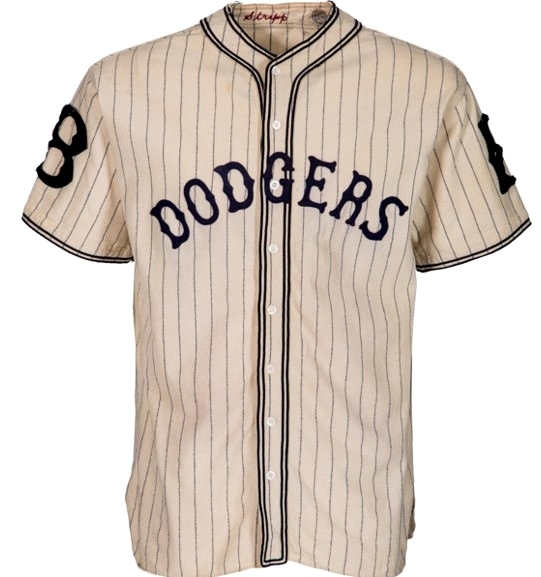 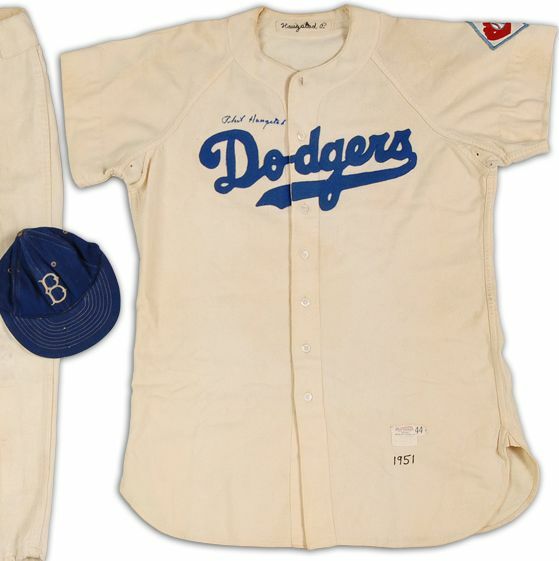 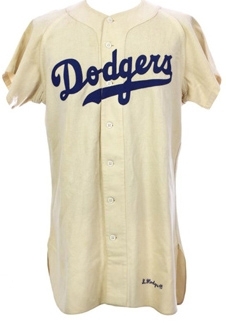 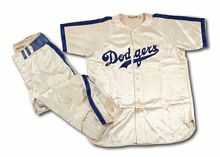 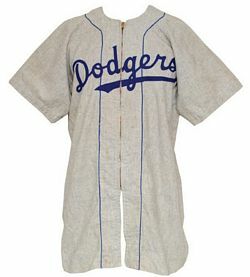 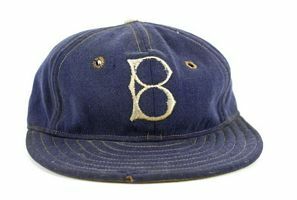 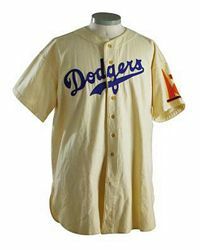 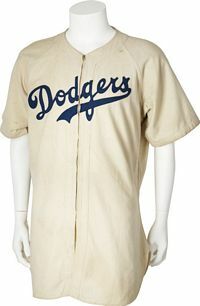 During the 1932 season the team officially adopts the Dodgers nickname. 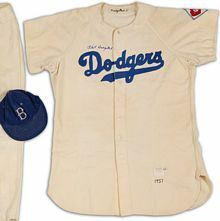 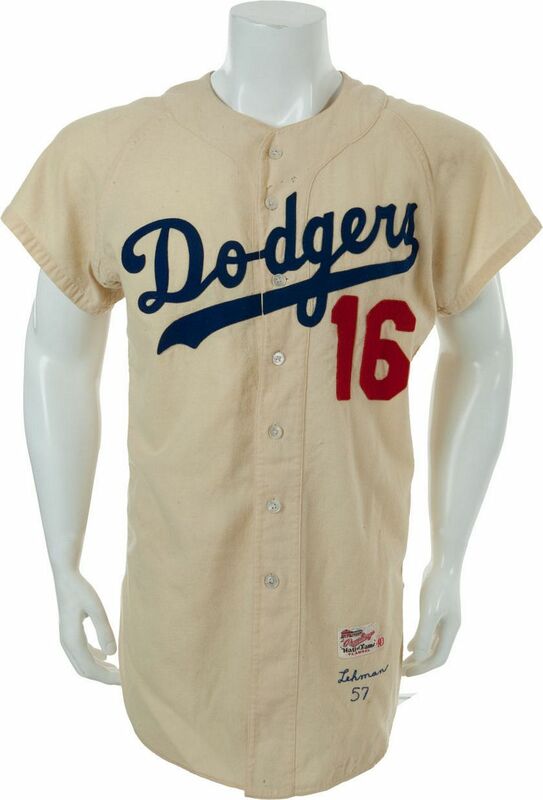 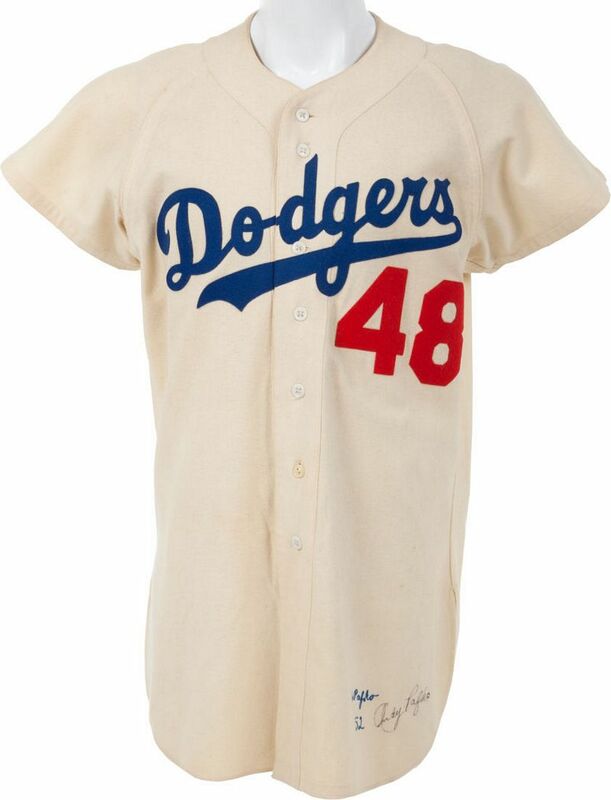 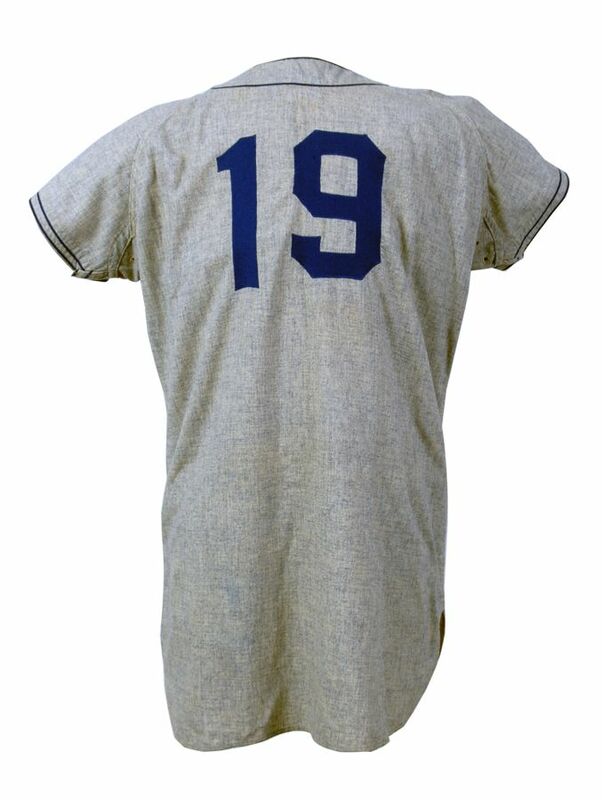 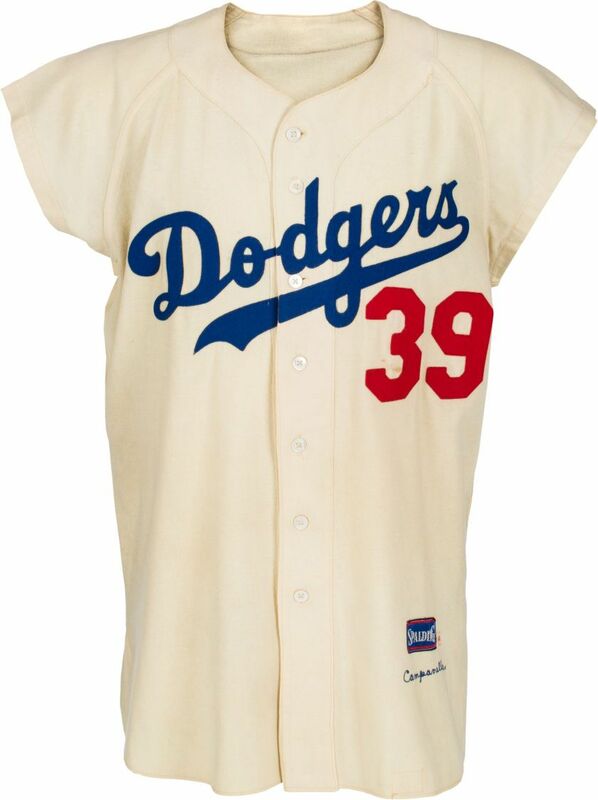 "Dodgers" script and back numbers are added to home jerseys, road script is changed to "DODGERS" . This jersey is original but lettering has been restored. 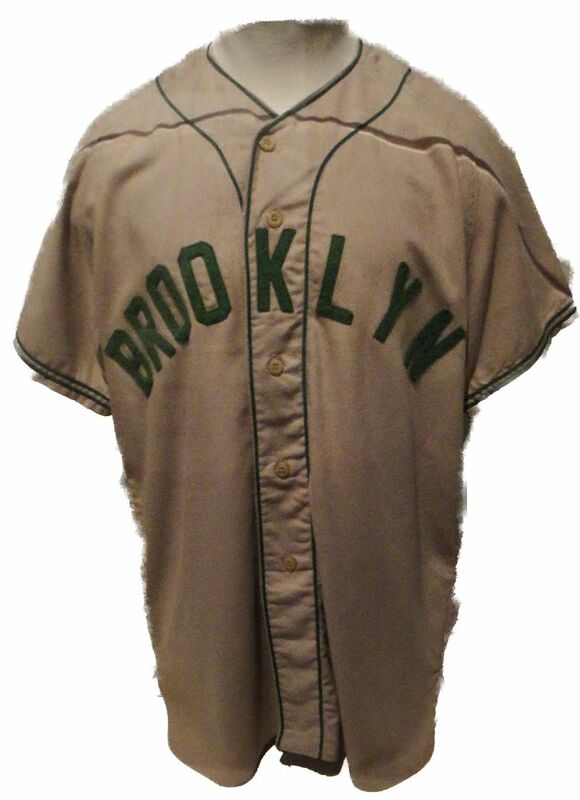 "BROOKLYN" returns to both jersey chests. The Dodgers wear green for one season. 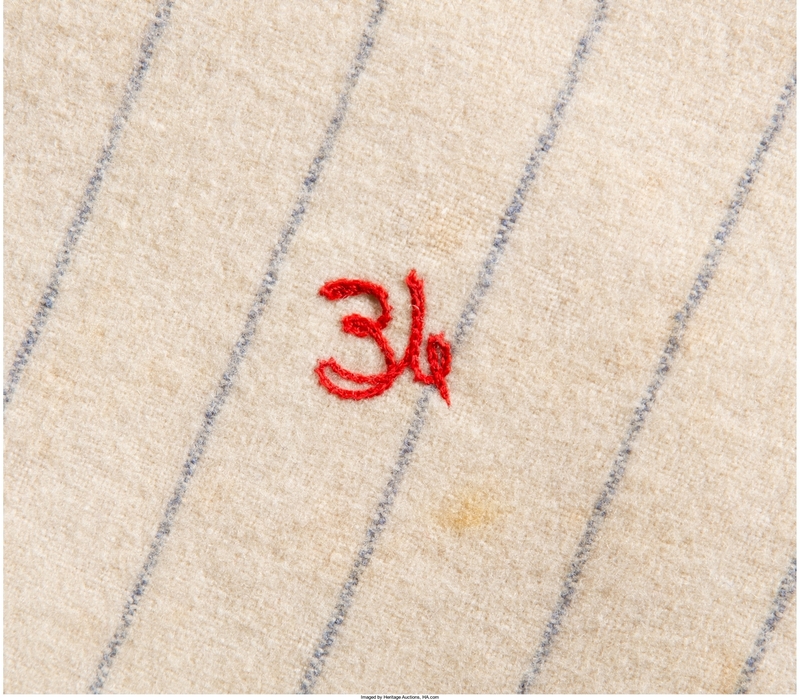 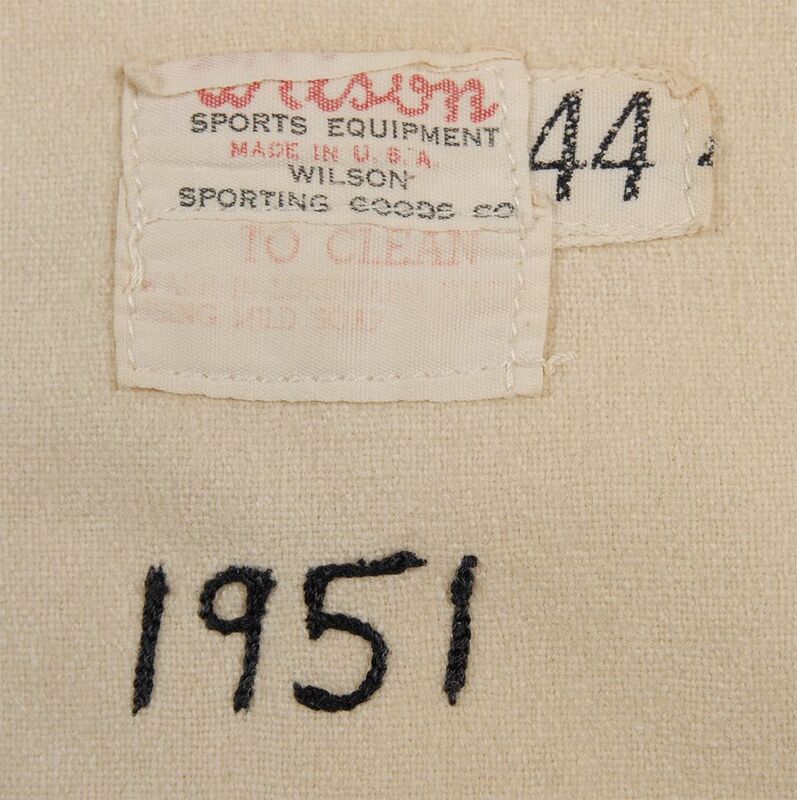 The jersey we're familiar with appears in its initial form. 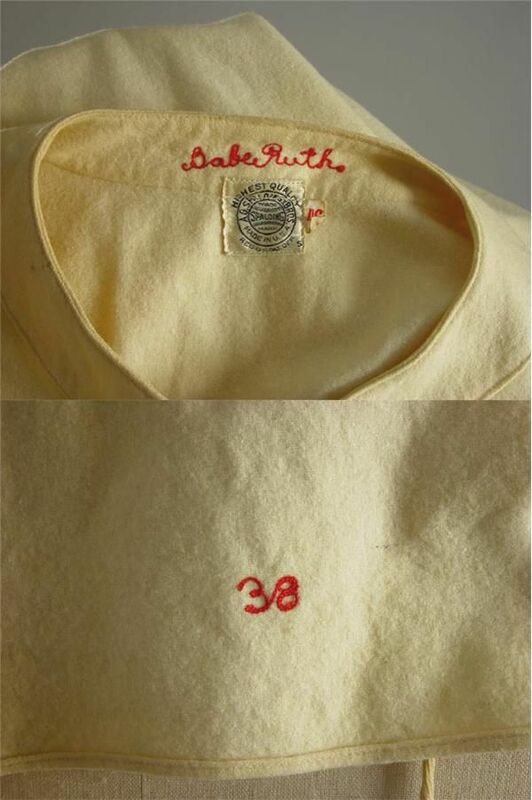 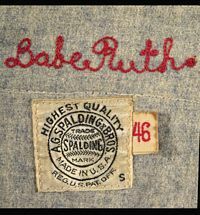 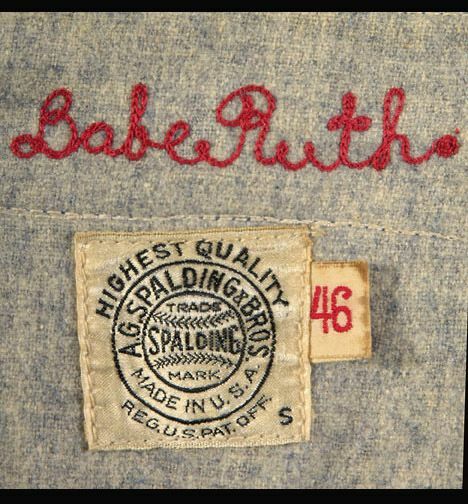 All jerseys were zippered - except coach Babe Ruth, whose jerseys are shown here. 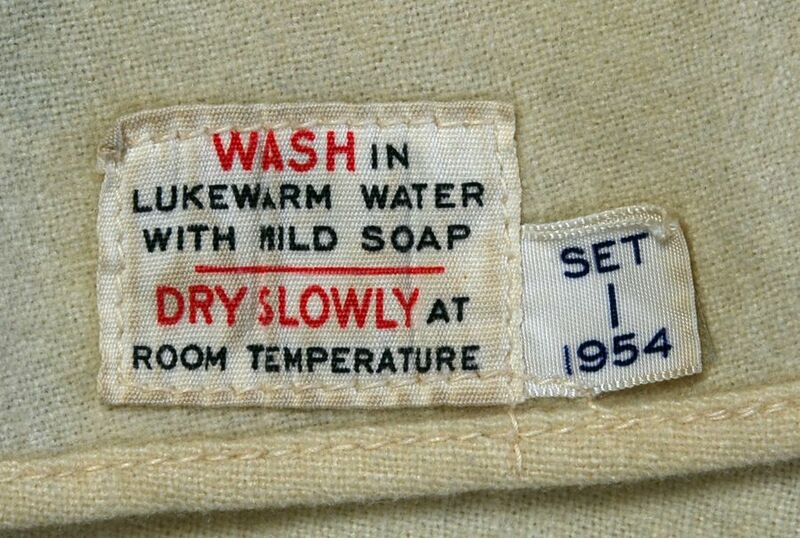 White cap used at home. 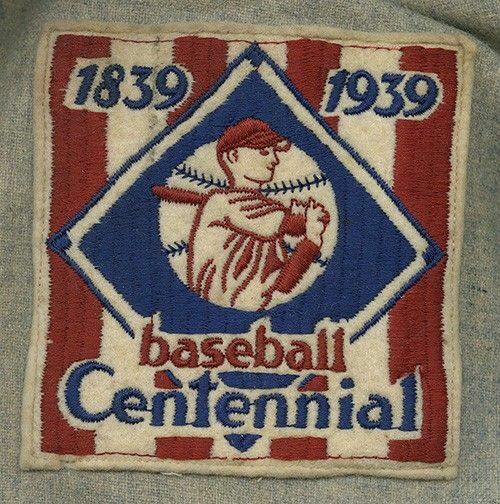 1939 World's Fair sleeve patch is worn by NY teams in 1938. 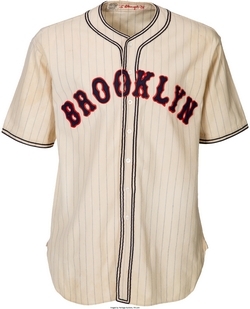 Script on the road jersey changes to "Brooklyn". 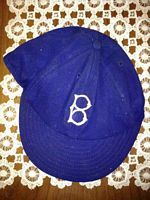 White cap retired. 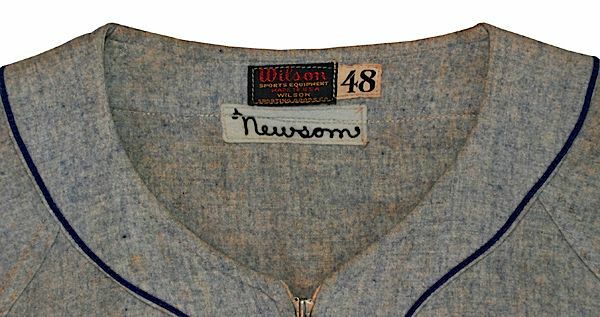 Zippers replace buttons. 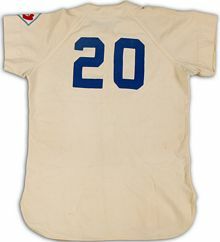 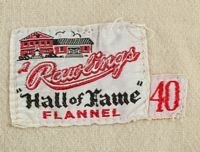 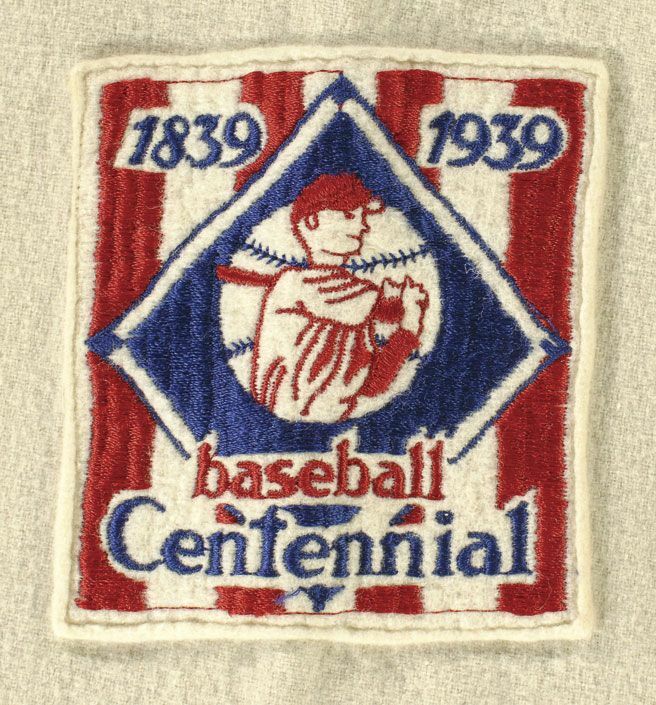 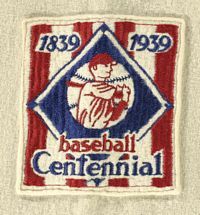 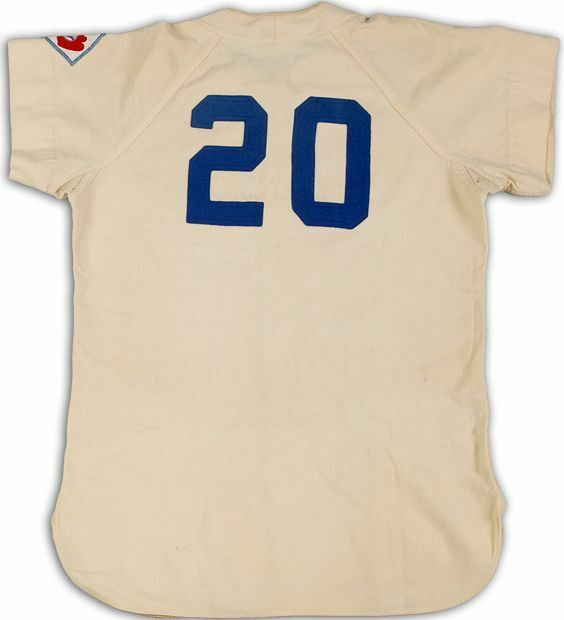 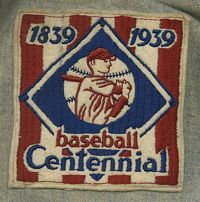 Baseball centennial sleeve patch worn 1939. 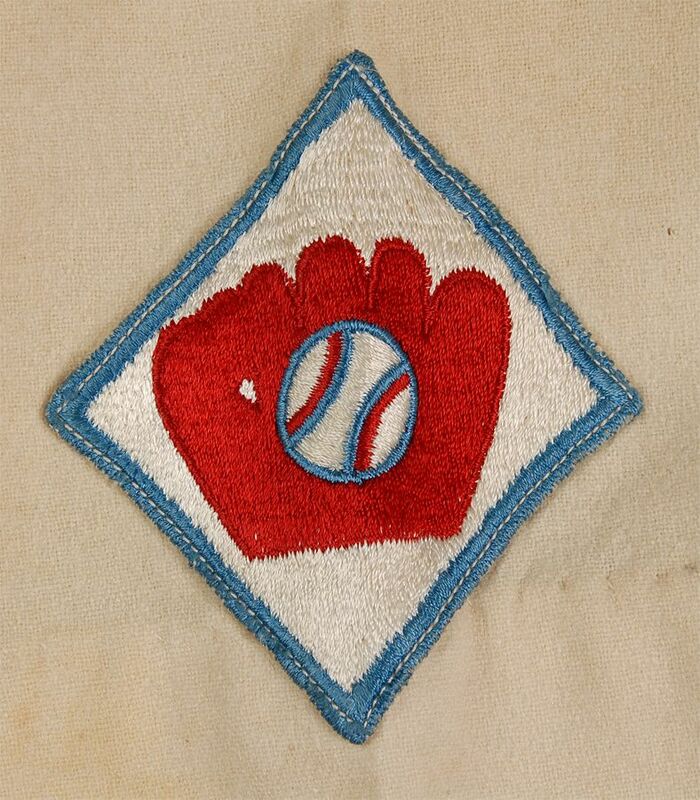 Stars & Stripes patch worn 1943, has been removed here. 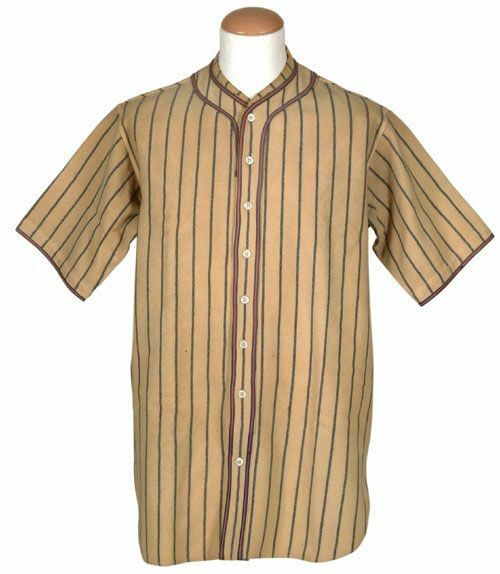 Buttons return. 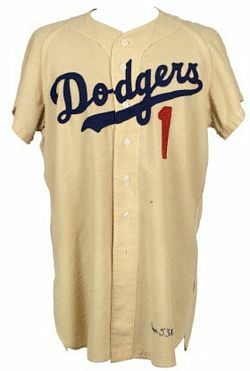 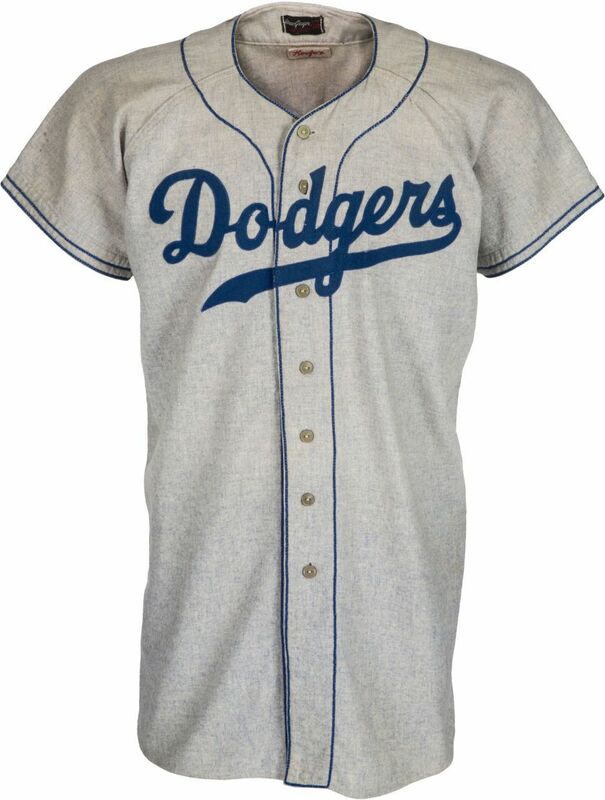 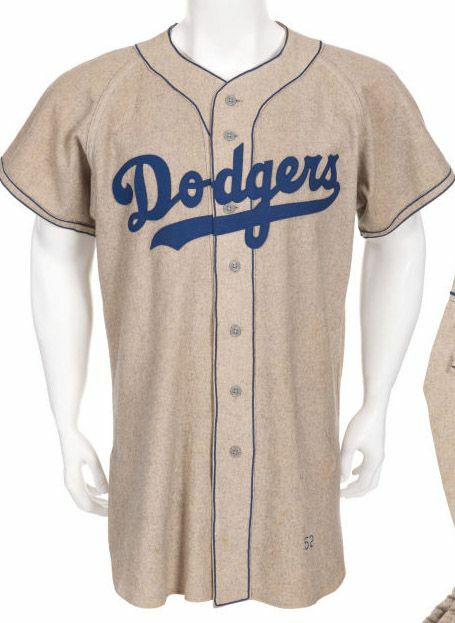 The Dodgers introduce a set of alternate satin jerseys - white and light blue - for night games (NY Times Feb 1944 "Dodgers Get 2 Sets of Satin Uniforms"). 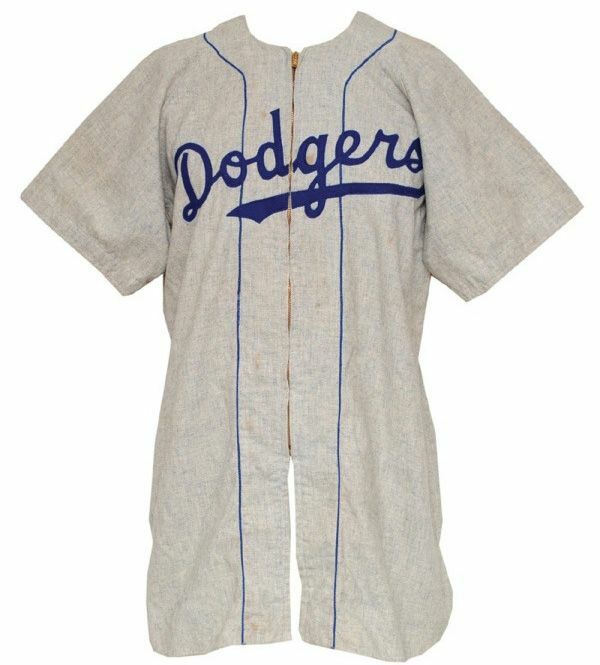 1945 home jerseys are zippered, road buttoned. A dark blue satin alternate road jersey replaces the powder blue satin jersey. 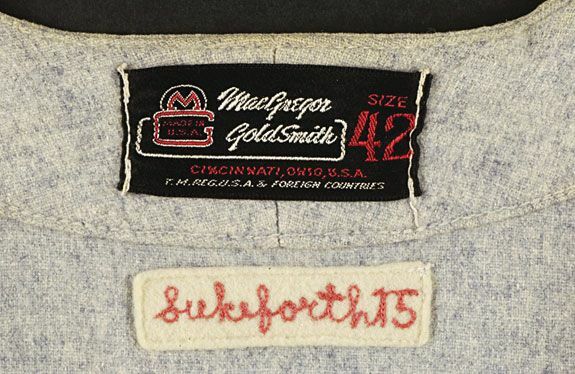 Satin road alternate dropped. 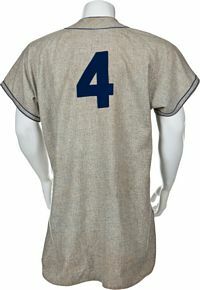 Script on home jerseys is thicker and moved more to the left side of the jersey, as compared with earlier home jerseys and the current road jersey. Road jersey script changes to "Dodgers". 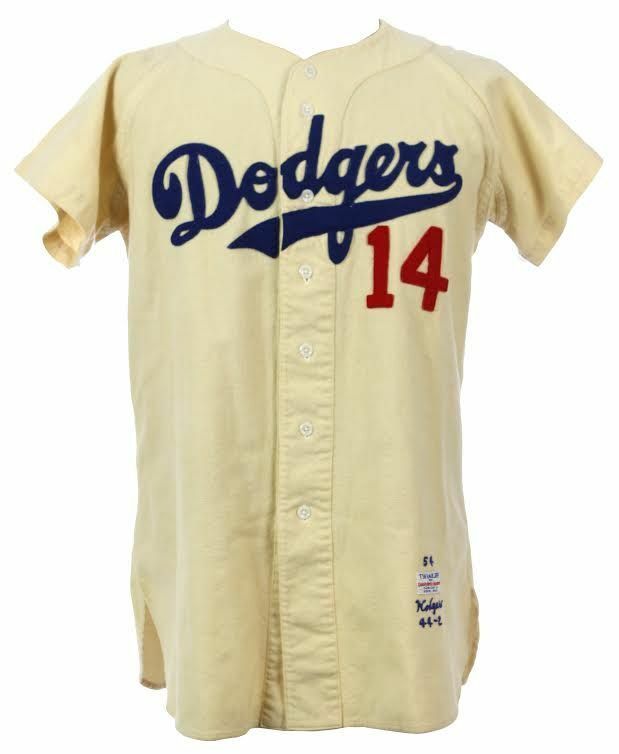 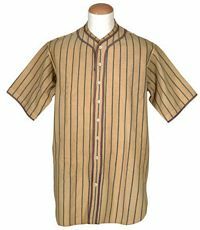 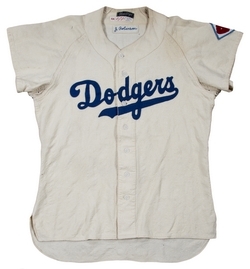 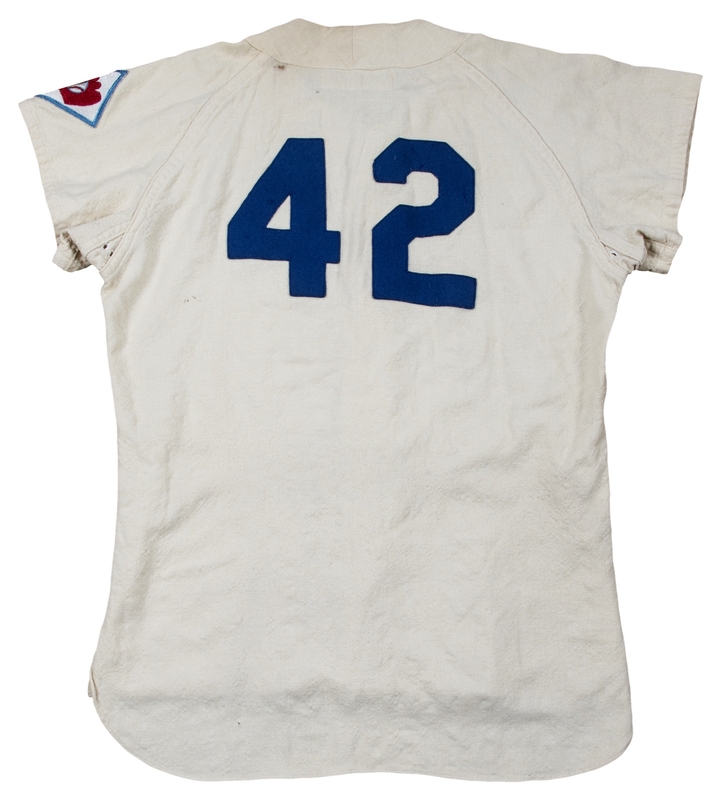 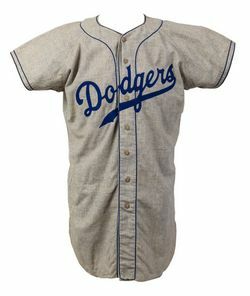 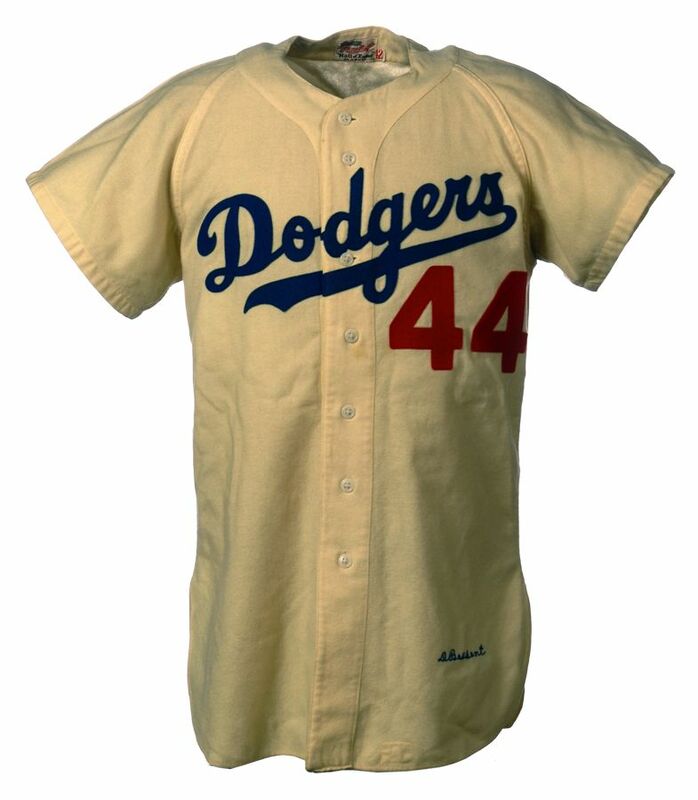 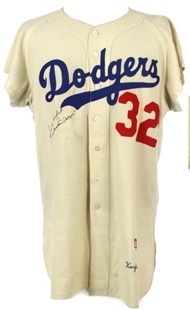 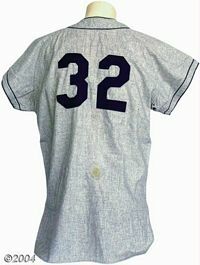 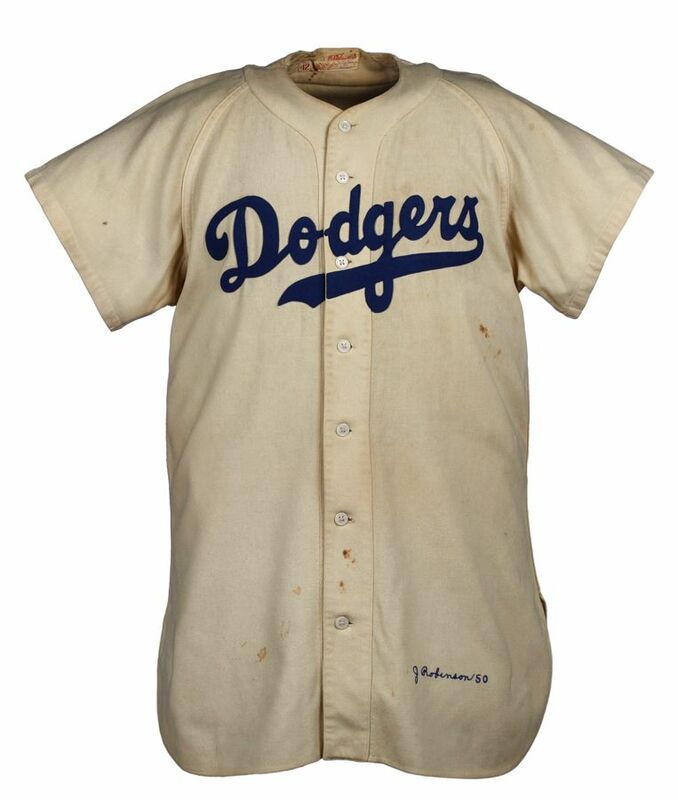 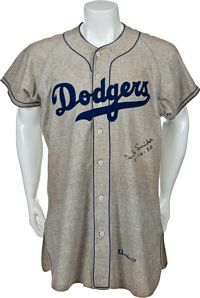 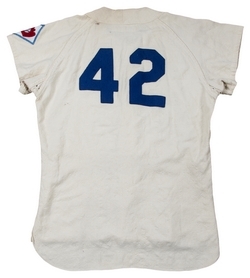 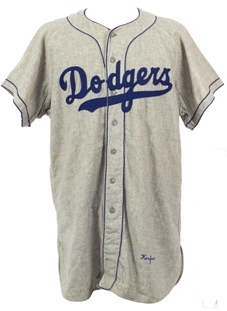 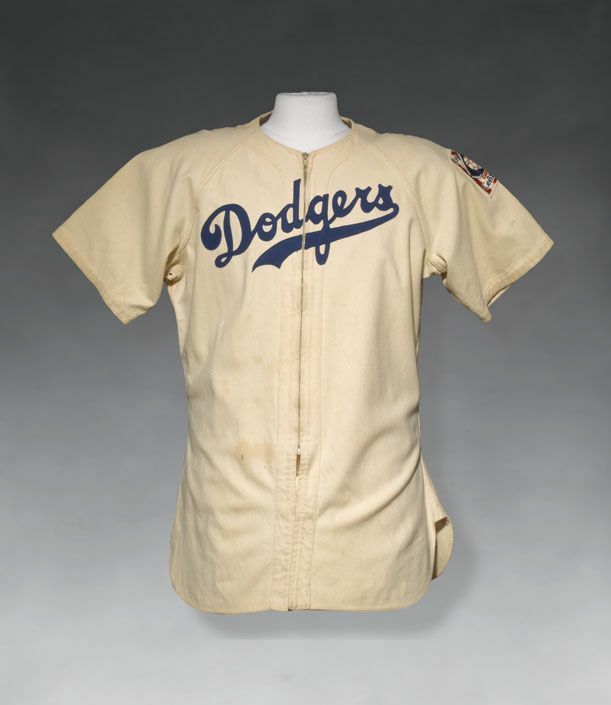 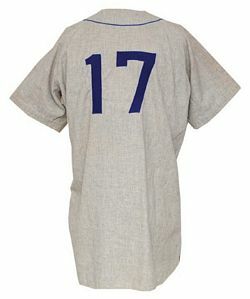 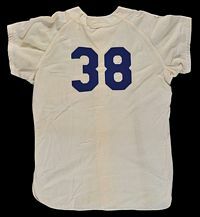 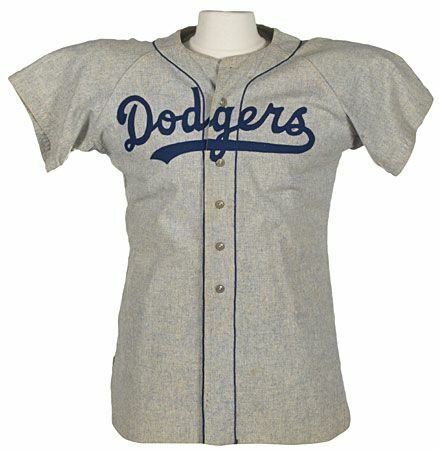 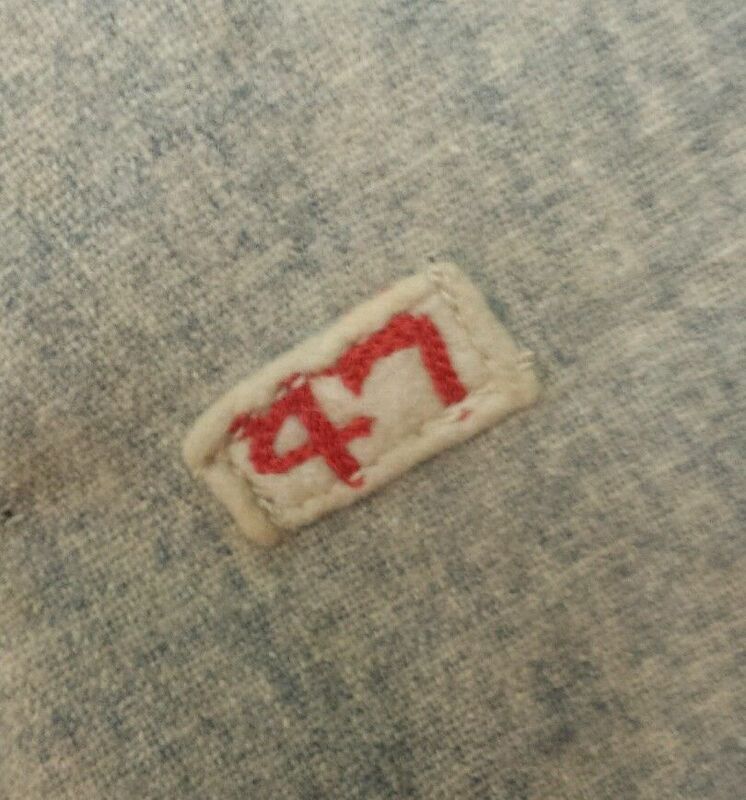 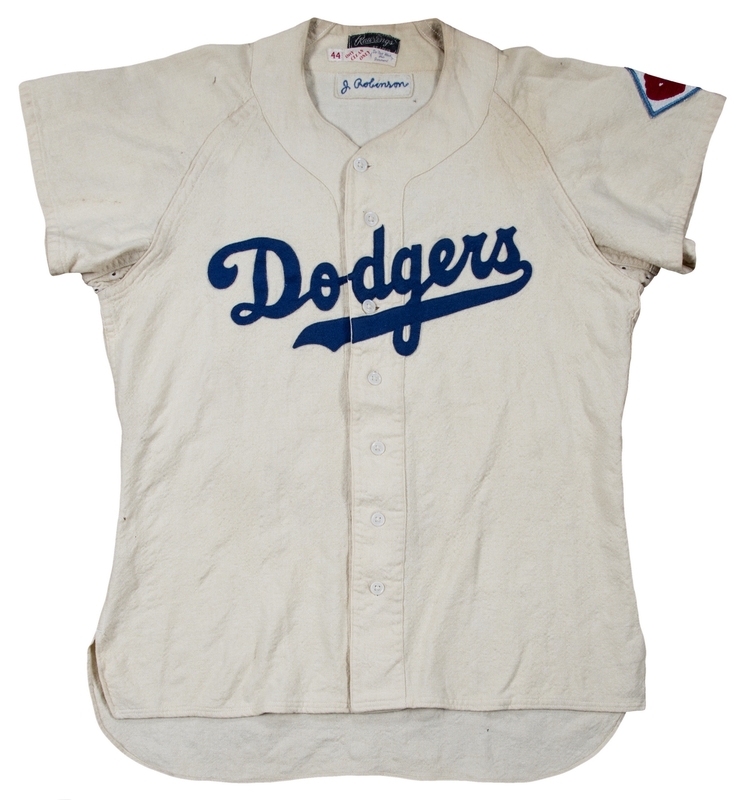 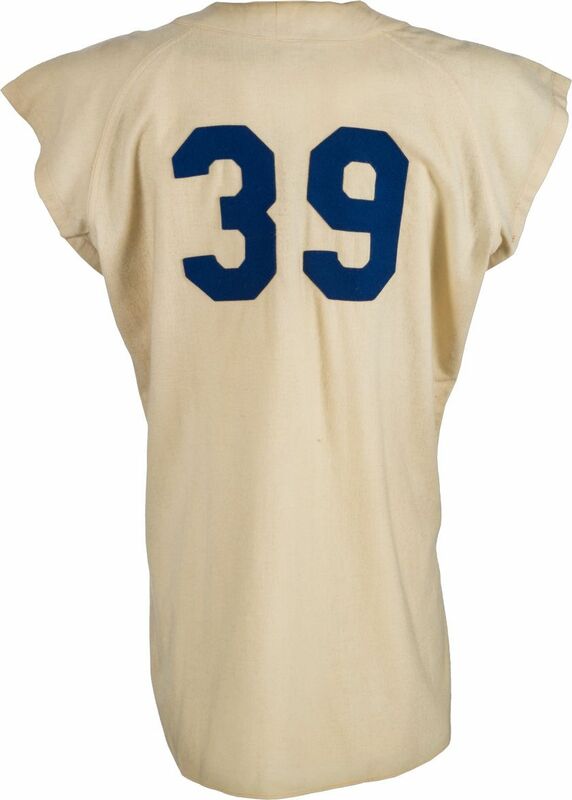 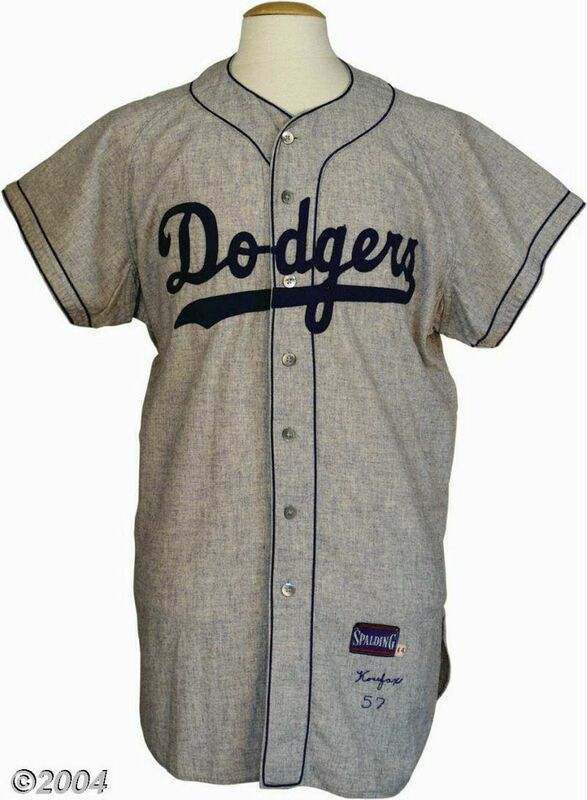 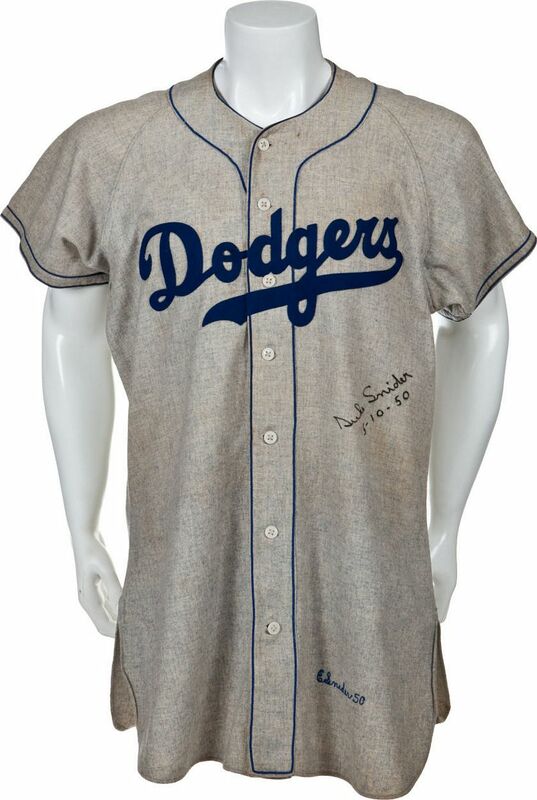 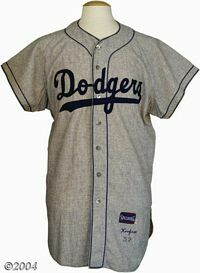 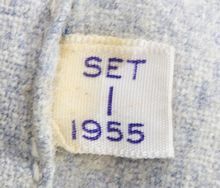 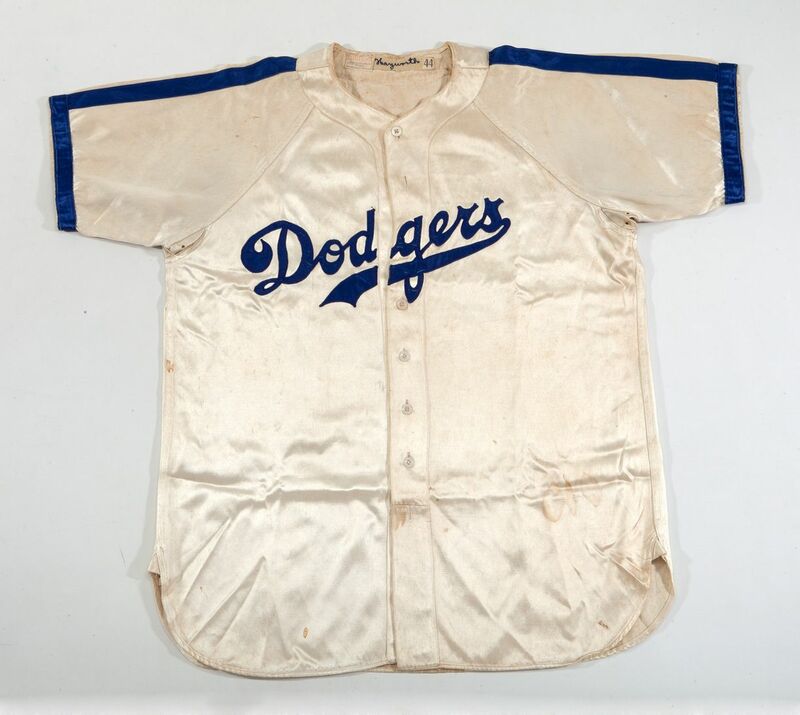 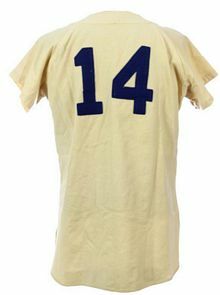 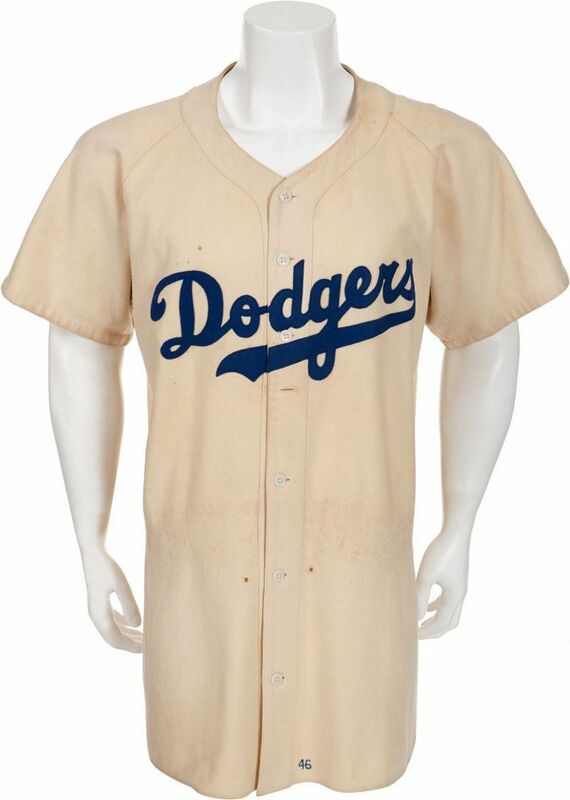 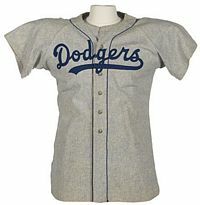 1946 jerseys are mostly zippered, but players could opt for buttons. 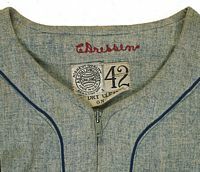 Satin home jersey now has zippers.MacGregor Goldsmith becomes a jersey supplier and also supplies caps with blue (rather than white) buttons, which seem to be worn by very few players. 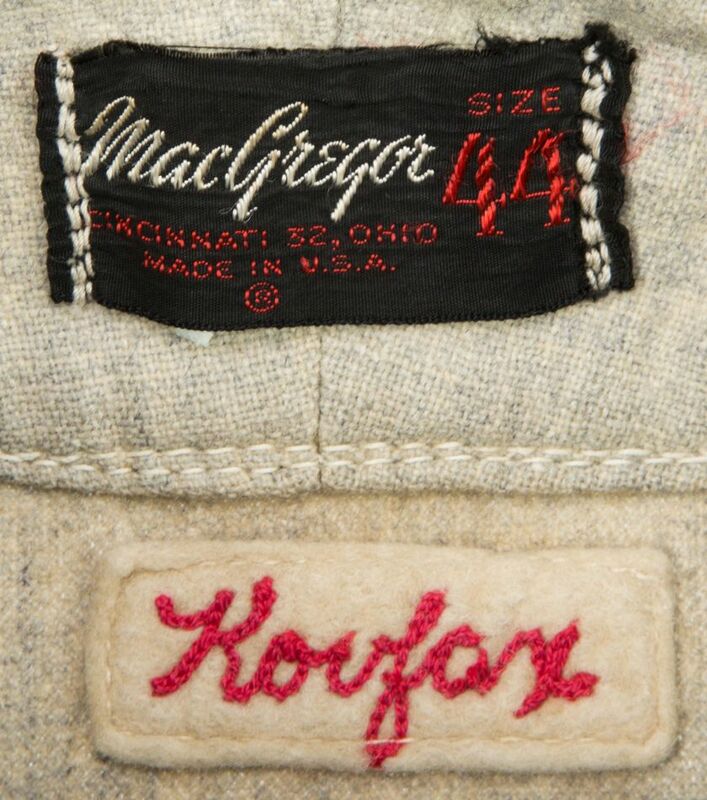 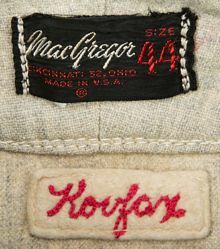 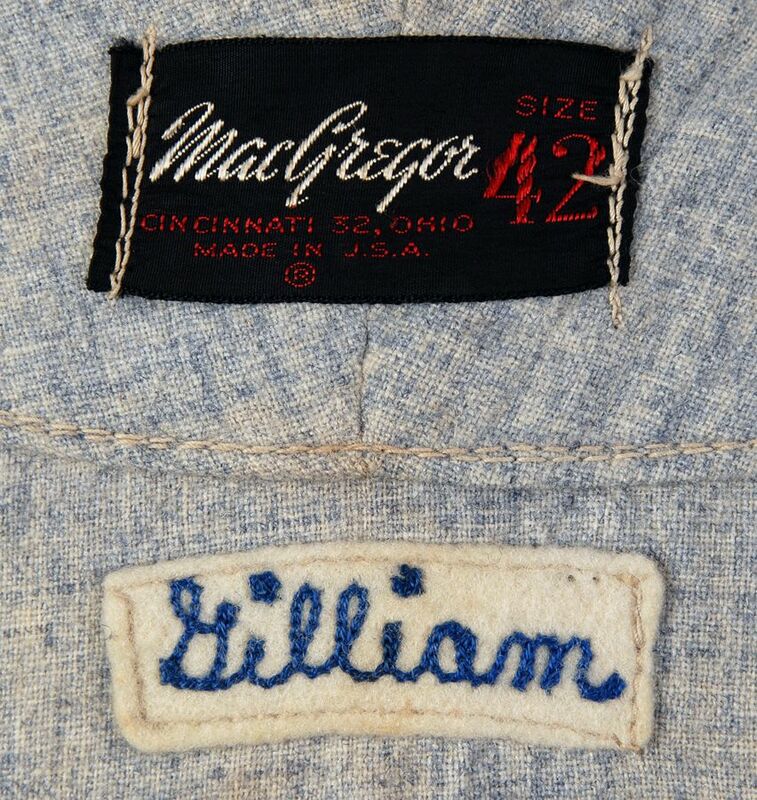 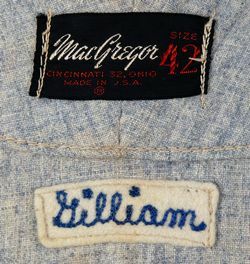 The thinner script of MacGregor jerseys from here on is quite noticeable. Jerseys are button-down including the home white satin. 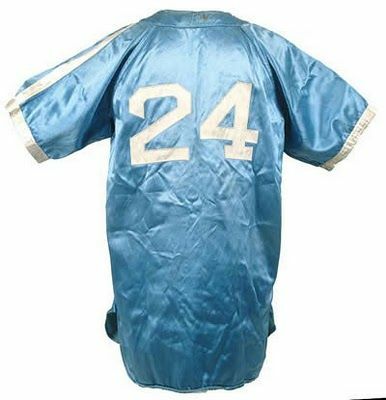 Last year for satin home jersey, which has zippers again. 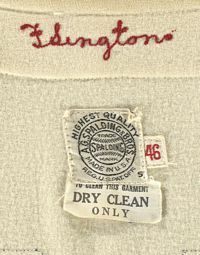 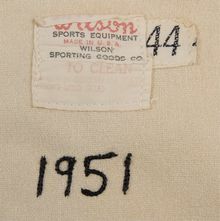 Spalding (home), MacGregor GoldSmith (road), Wilson (Home Alternate). 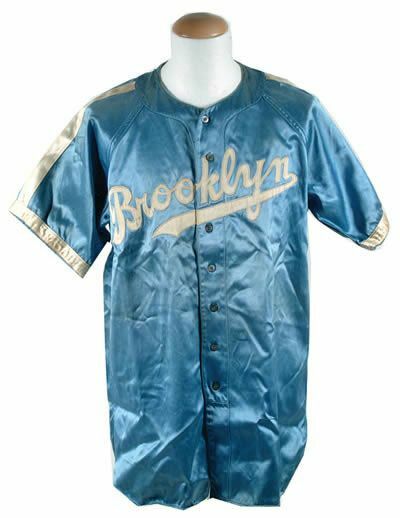 Satin alternate jersey is dropped. 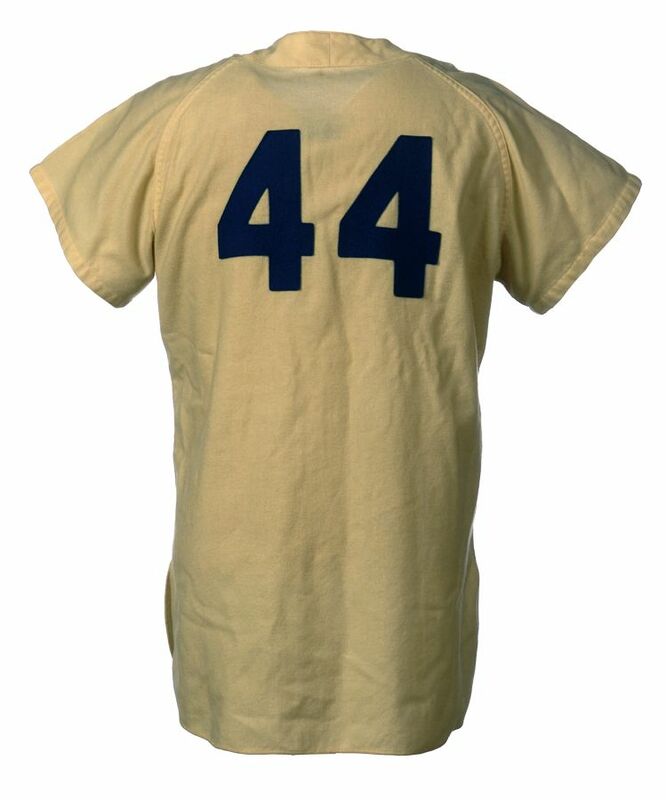 Road jersey script is now thicker and positioned the same as home jerseys. 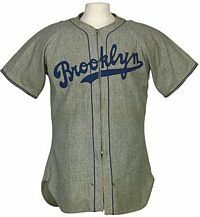 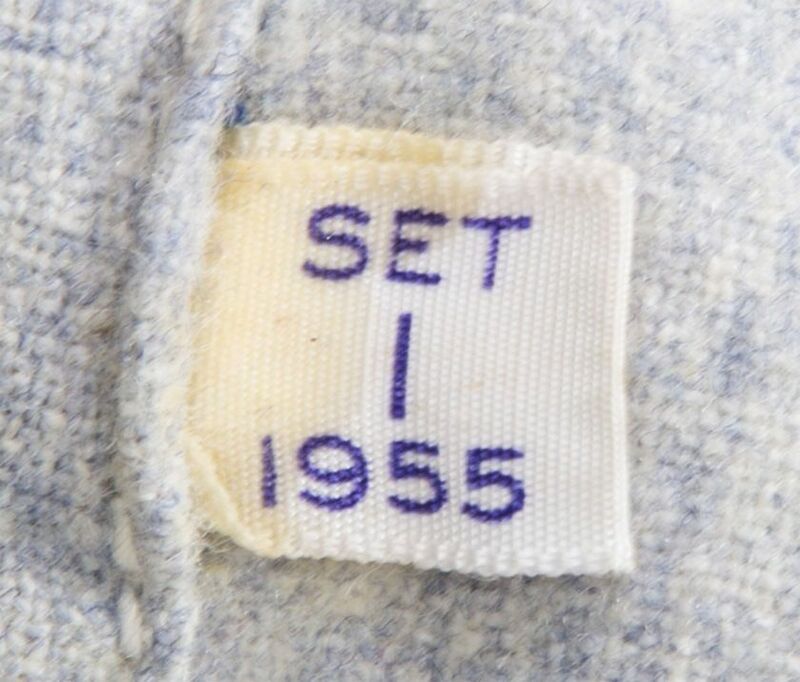 I think this is a 1949 jersey, but it could be from 1950. 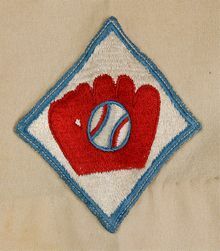 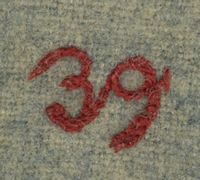 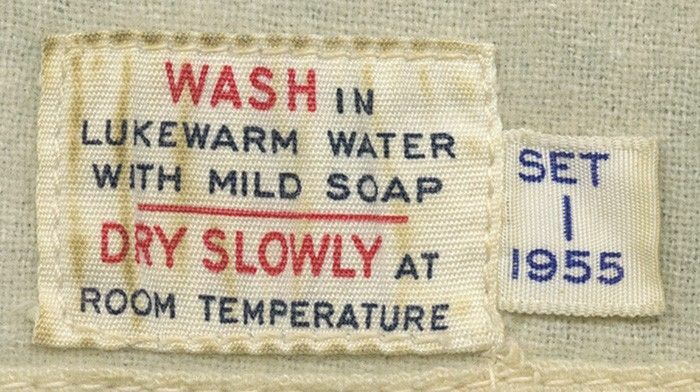 NL Anniversary sleeve patch worn 1951. 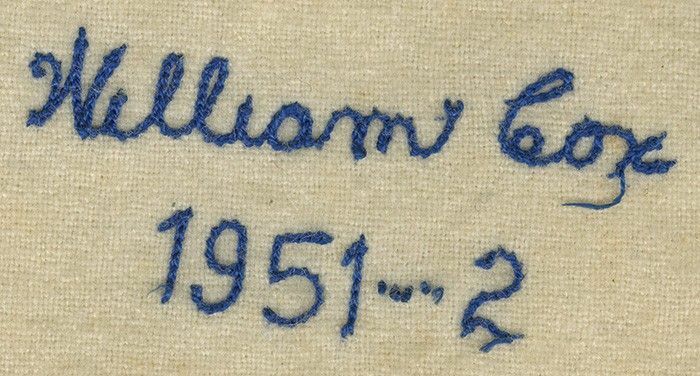 The script underline is extended. 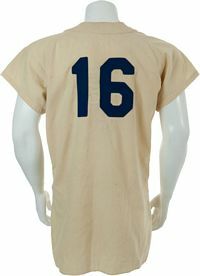 Numbers are added to the front of the home jersey for television. 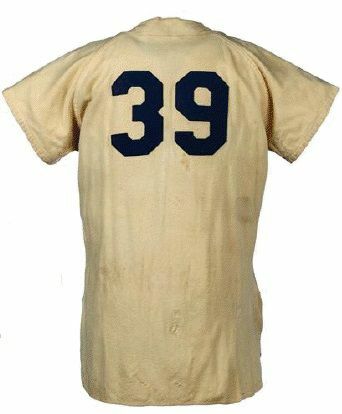 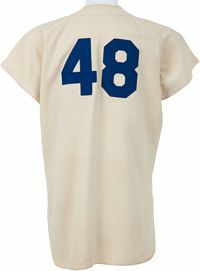 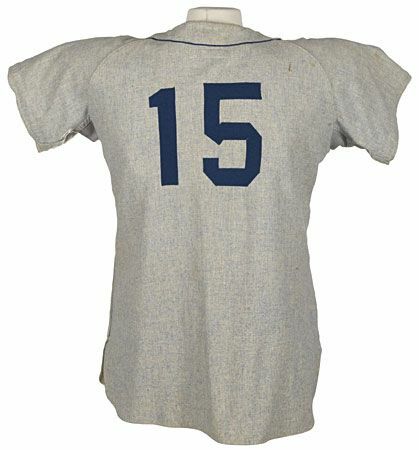 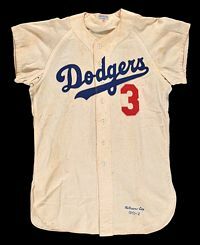 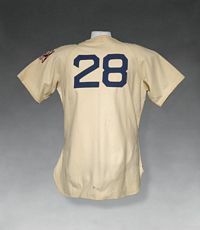 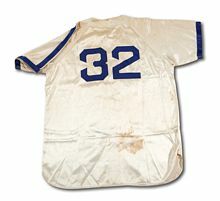 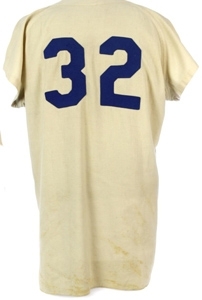 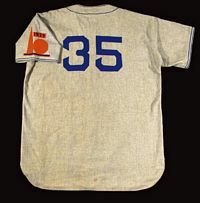 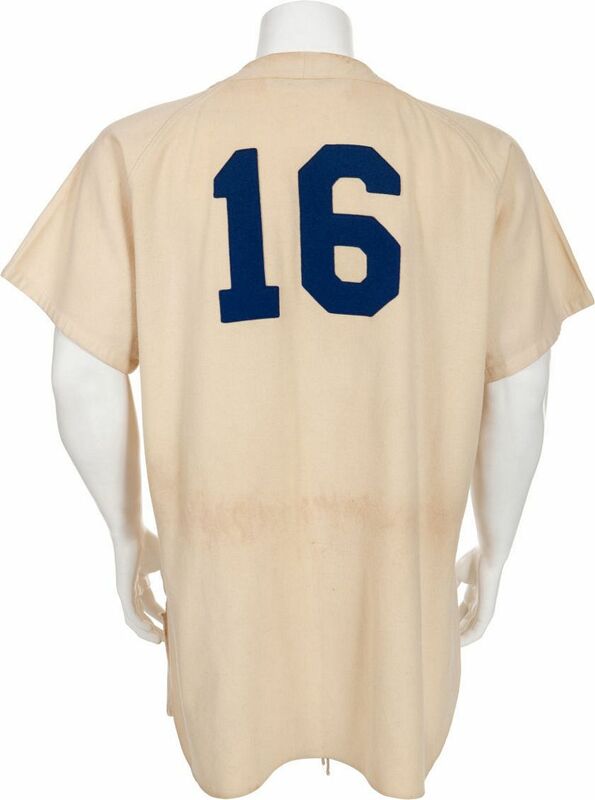 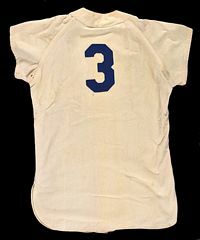 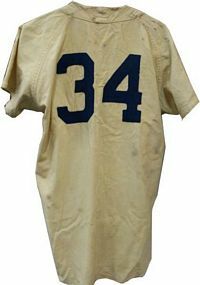 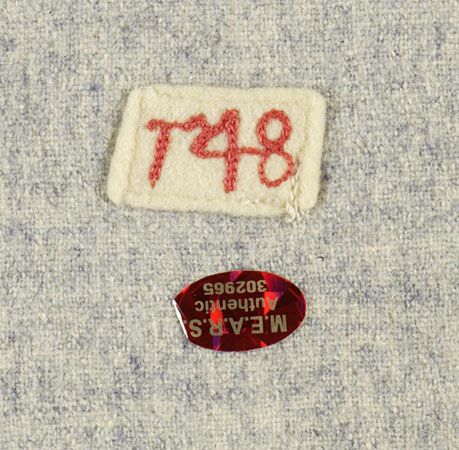 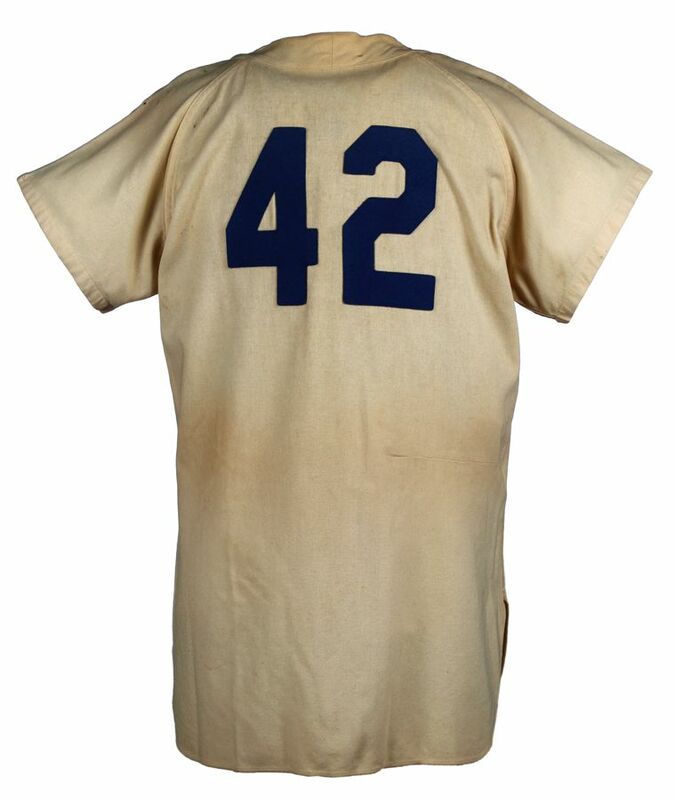 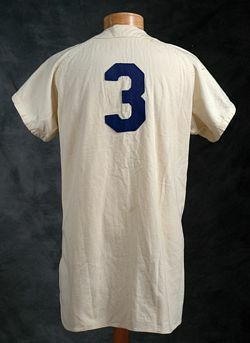 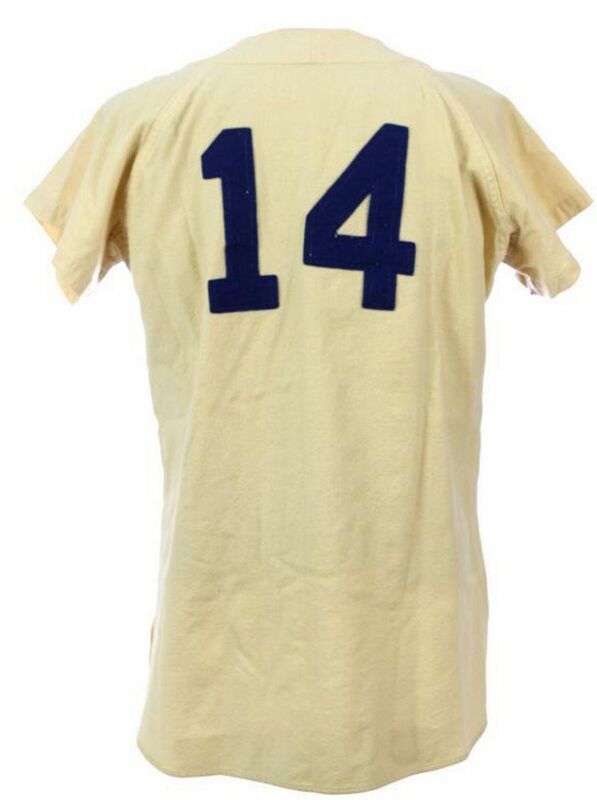 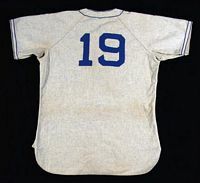 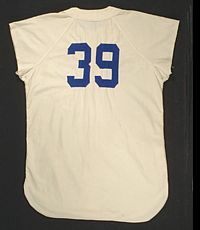 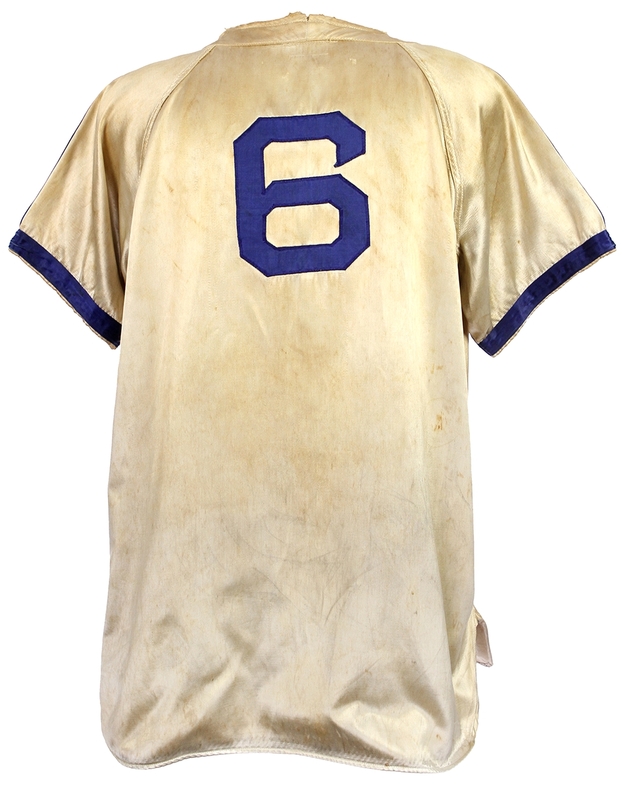 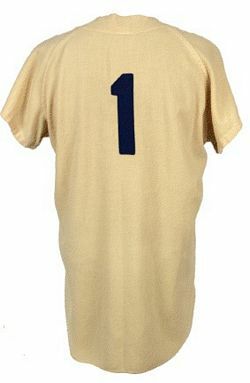 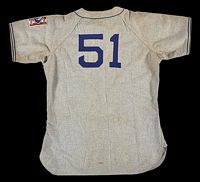 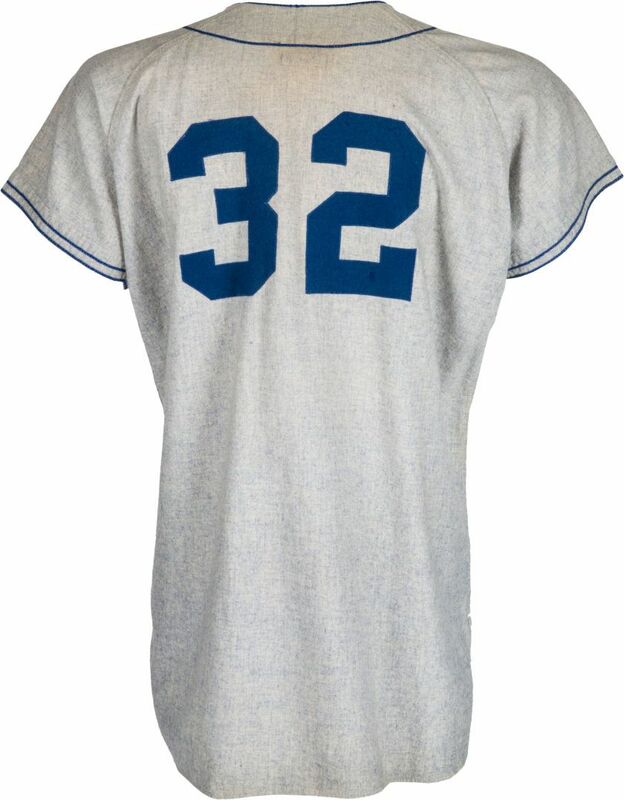 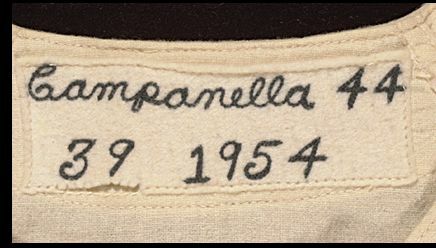 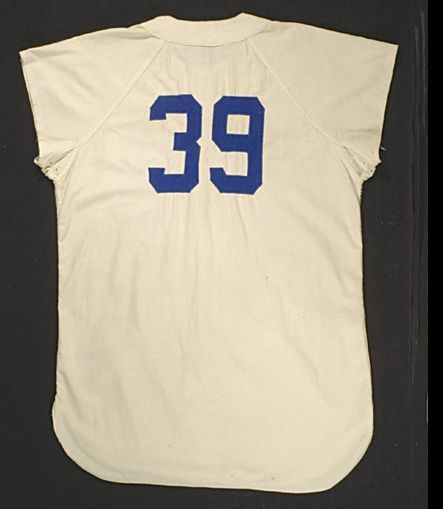 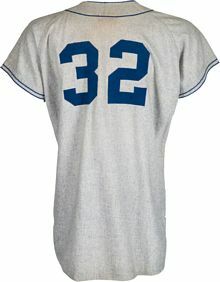 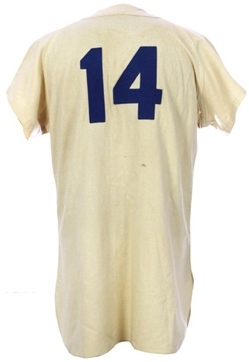 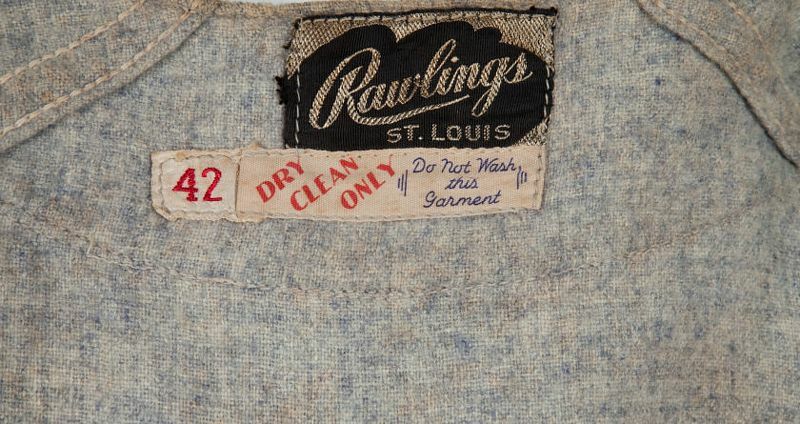 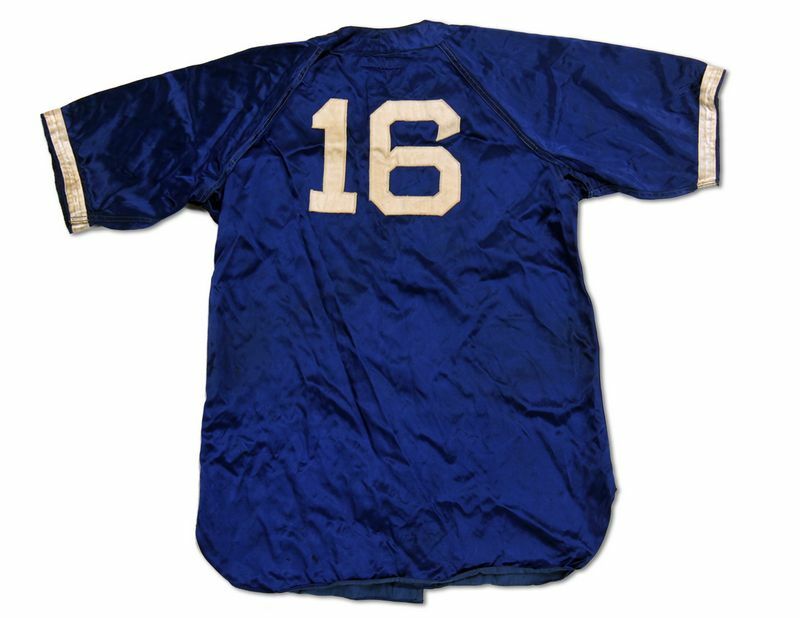 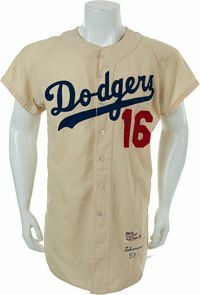 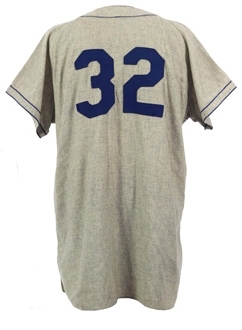 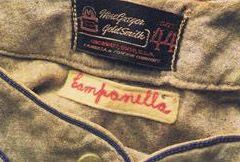 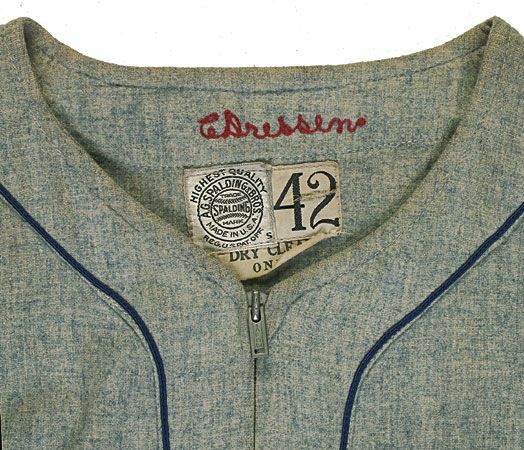 The numbers were actually added to the 1951 World Series jerseys - that the team never got to wear, thanks to the Giants comeback and Thomson's famous shot. 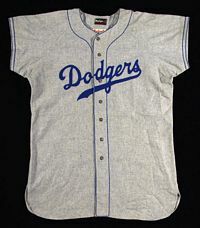 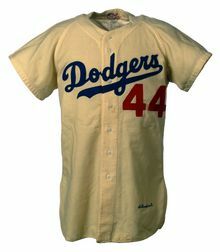 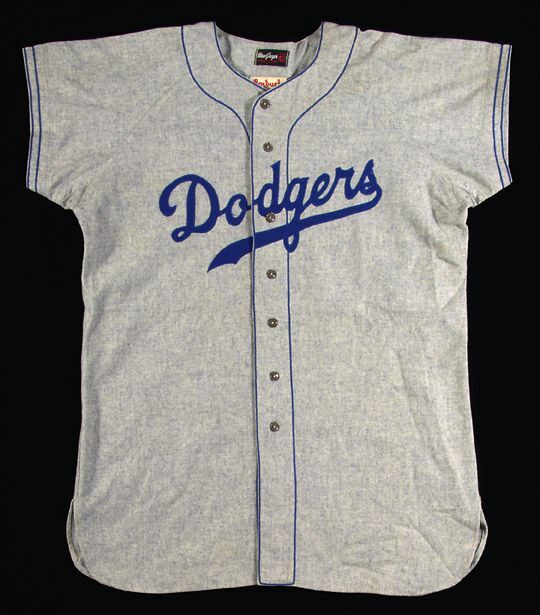 Those jerseys did debut in 1952, here is one below. 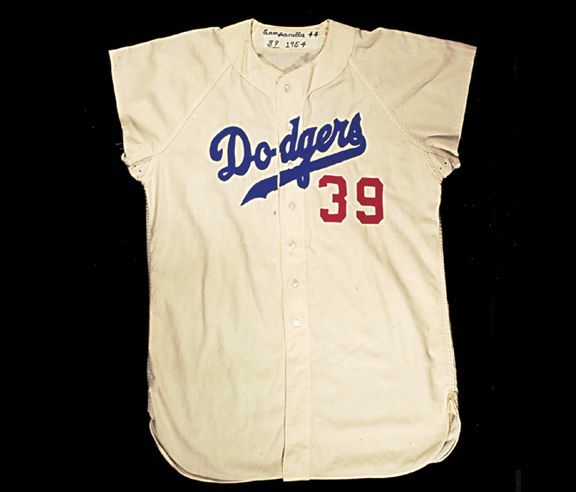 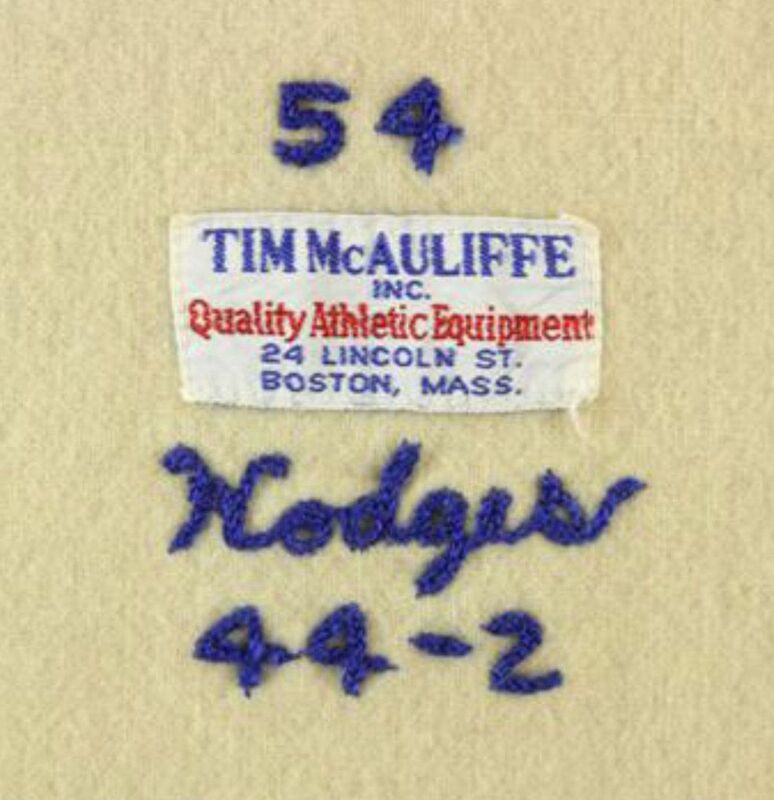 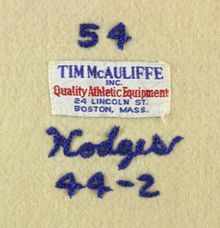 Note - In 1955 a set of "Presentation" home jerseys was made for every team member by Tim McAuliffe. 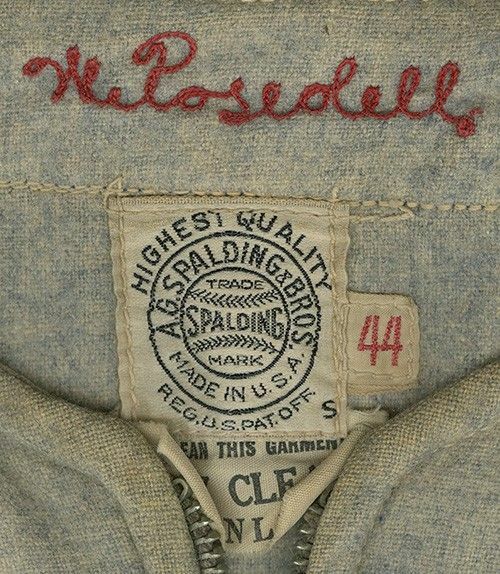 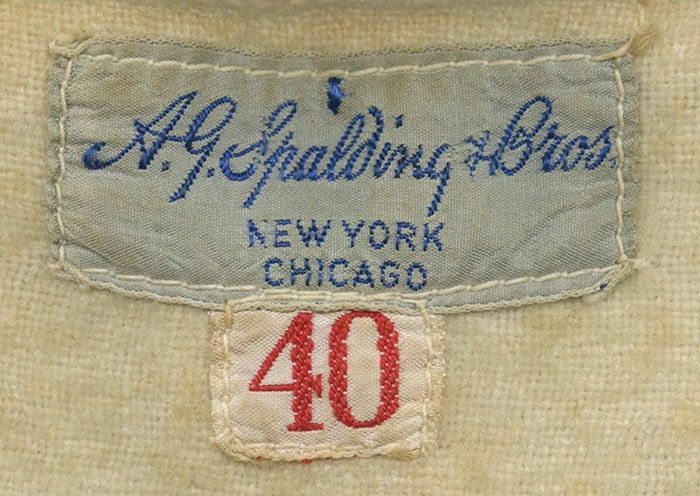 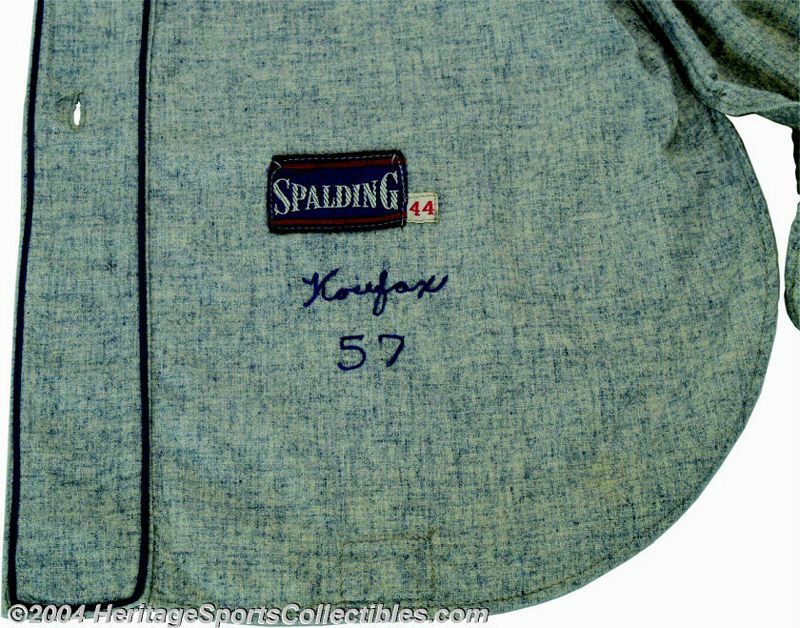 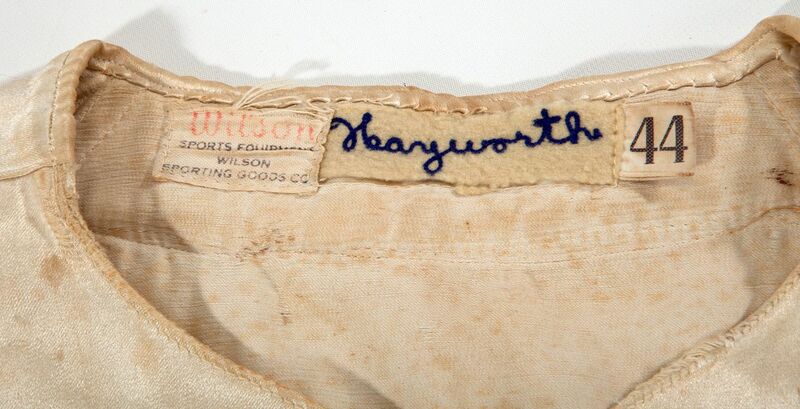 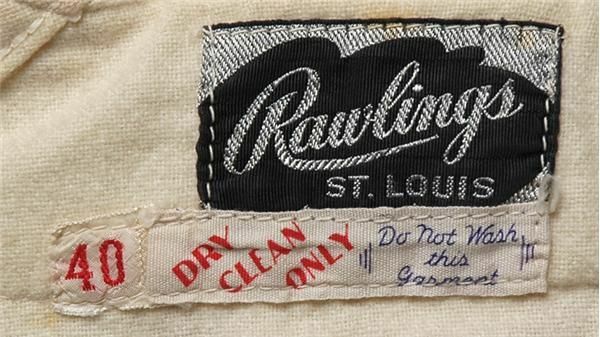 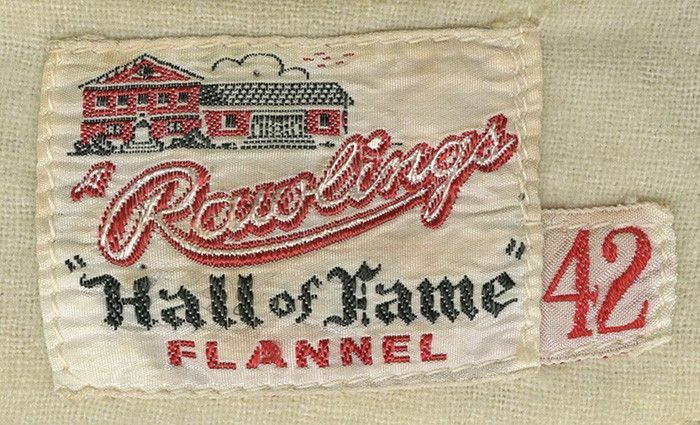 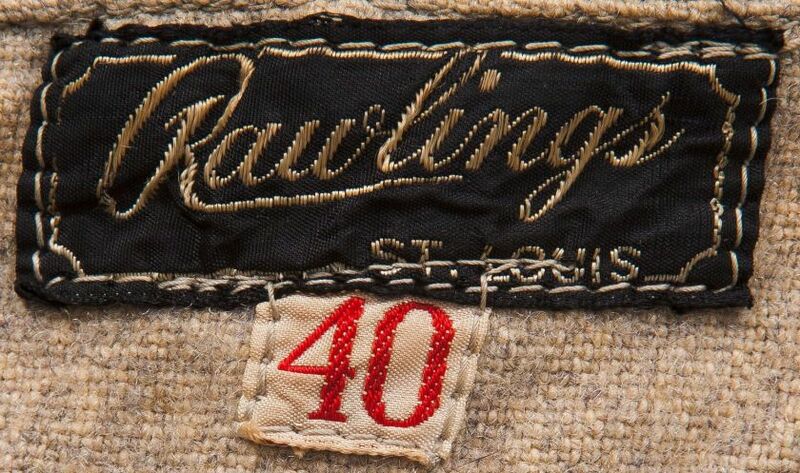 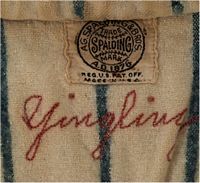 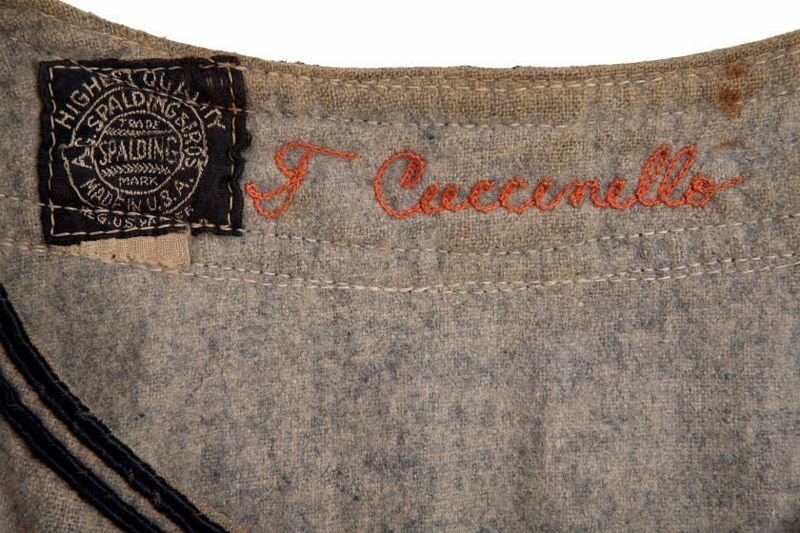 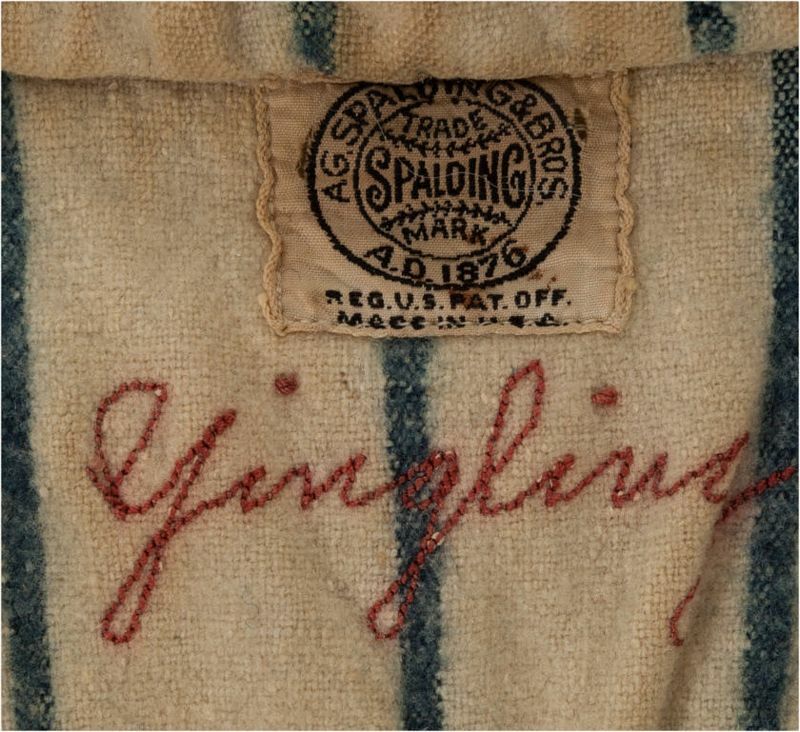 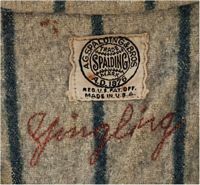 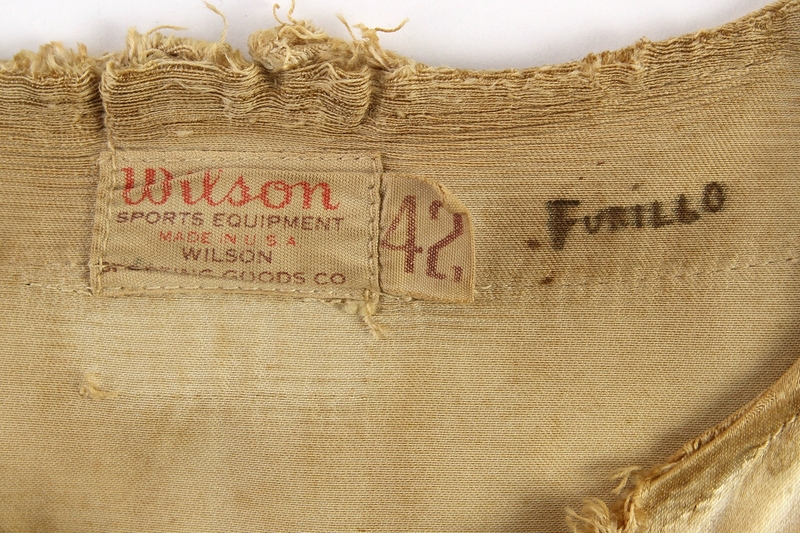 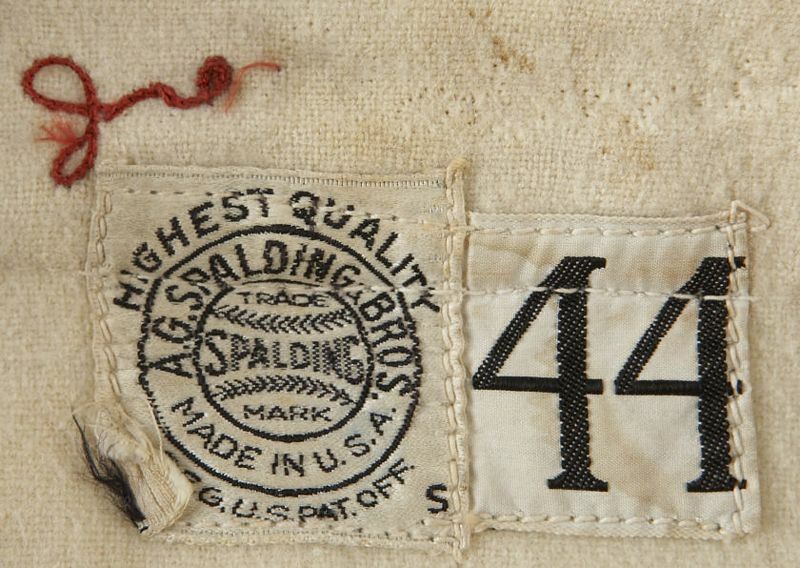 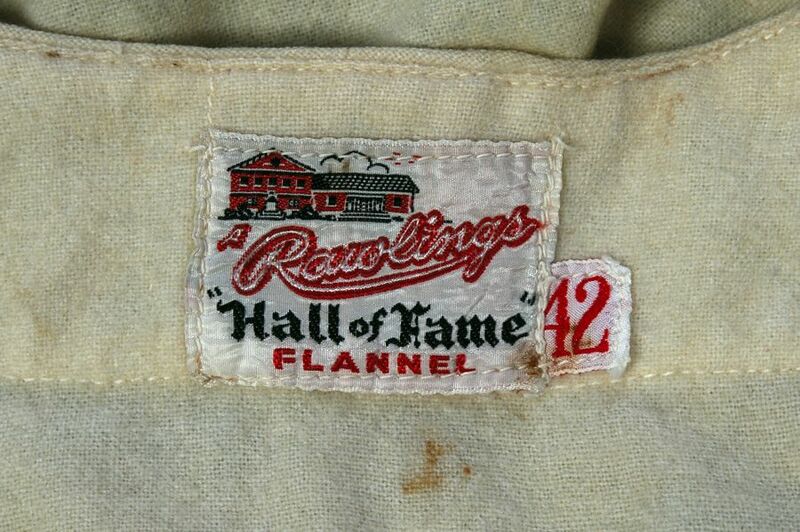 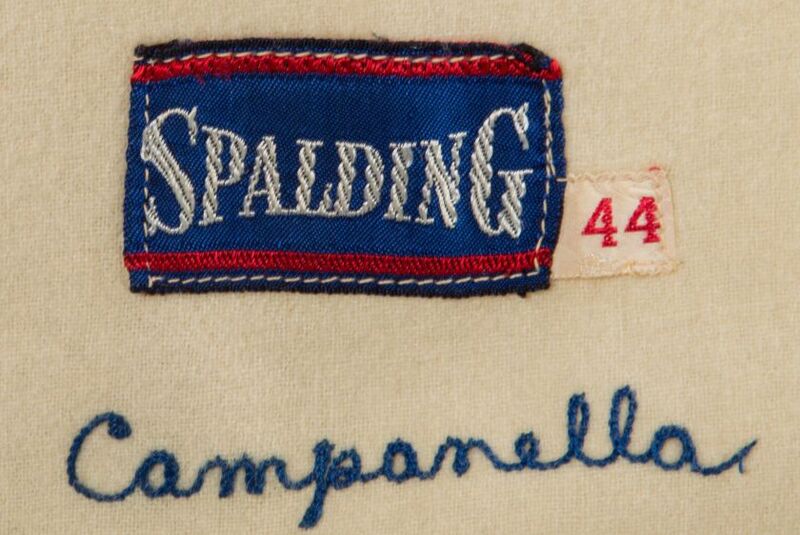 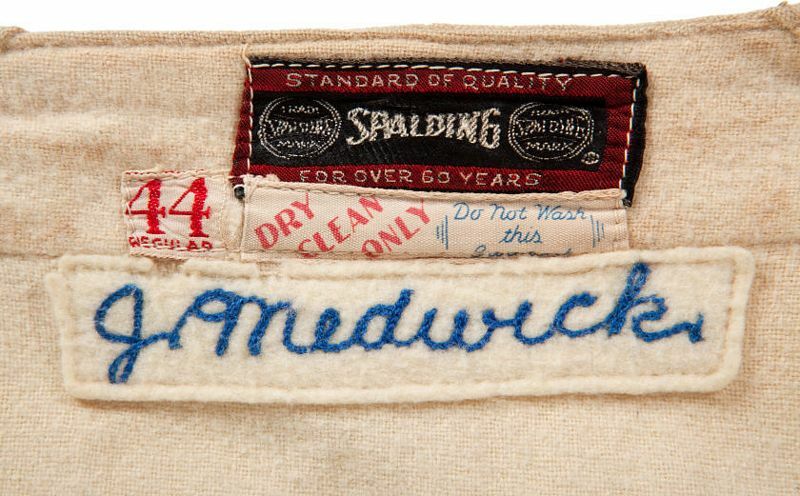 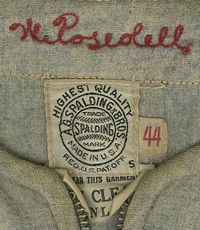 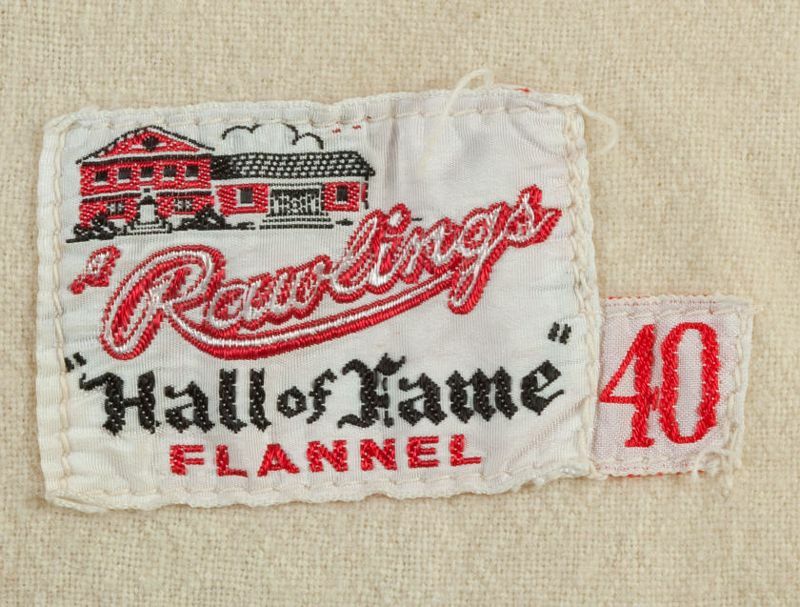 Those have the name in fancy stitching and are not game used.